I had a lovely meal in the pub, which seems like it does good trade. 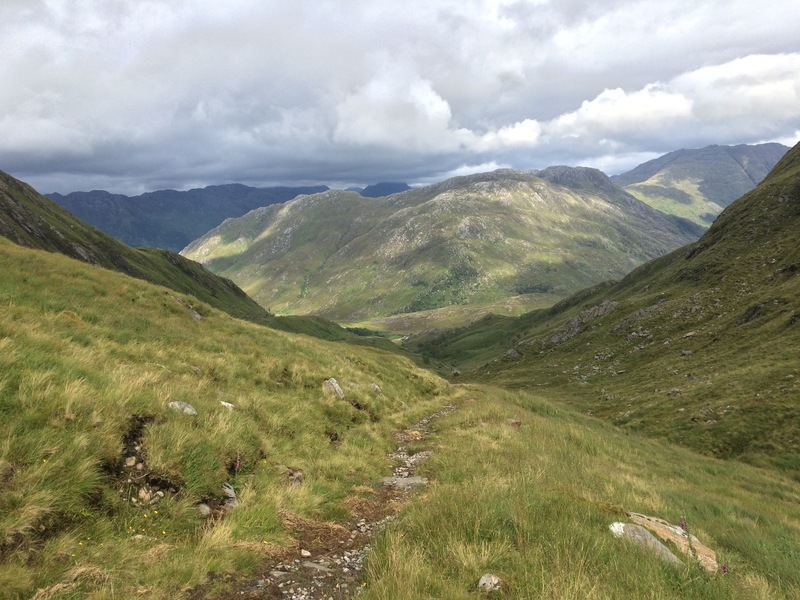 It was time to leave when one of the locals – an odd chap – started boring me to death and then told me if I was coming back to Knoydart he would quite like a partner so the offer was there if I fancied living with him. It was difficult to refuse such a proposal from such a weirdo but somehow I managed to. I walked back to my tent in the dark and the rain. It rained all night on and off so I had unbroken sleep as it seemed like mini tornadoes kept engulfing the tent in strong wind and heavy rain. 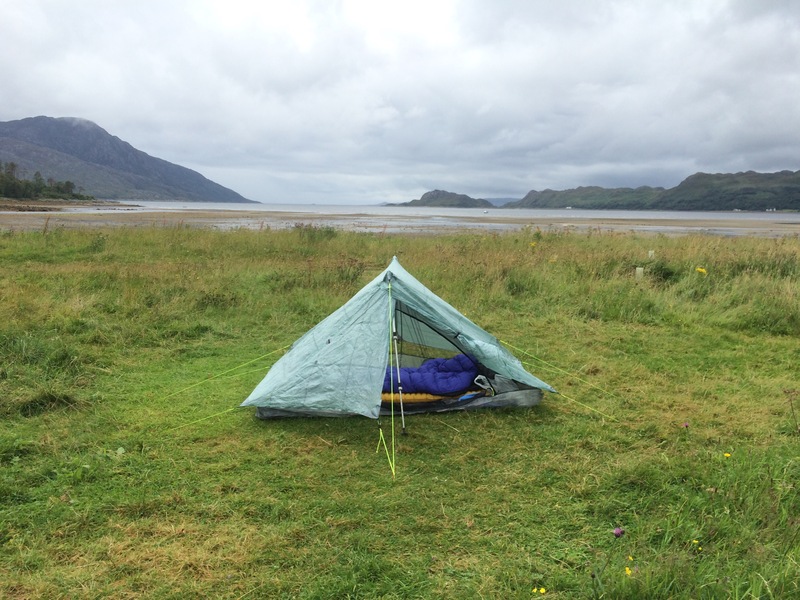 I thought it would be quiet at night in the middle of nowhere but how wrong I was; crashing waves, thundering waterfalls, howling wind, babbling burns and the pit-patter of heavy rain on the tent make for a noisy night! The heavy rain didn’t stop until 10 am so I languished huddled in my sleeping bag. Fortunately the easy route to Barisdale is only 8 miles along a track so I had plenty of time. The poor weather meant I discounted taking the more scenic route that involved climbing Ladhar Beinn (thanks for the tips Rohan). I was glad I waited for the rain to subside because I didn’t get rained on for the rest of the day although it was very damp and, judging by which peaks I could see (not many!) the cloud base rarely lifted above about 600m. Oh well, I’ve come to expect it now. On the bright side, I still had stunning views and the walk was so beautiful that I think I smiled the whole way. 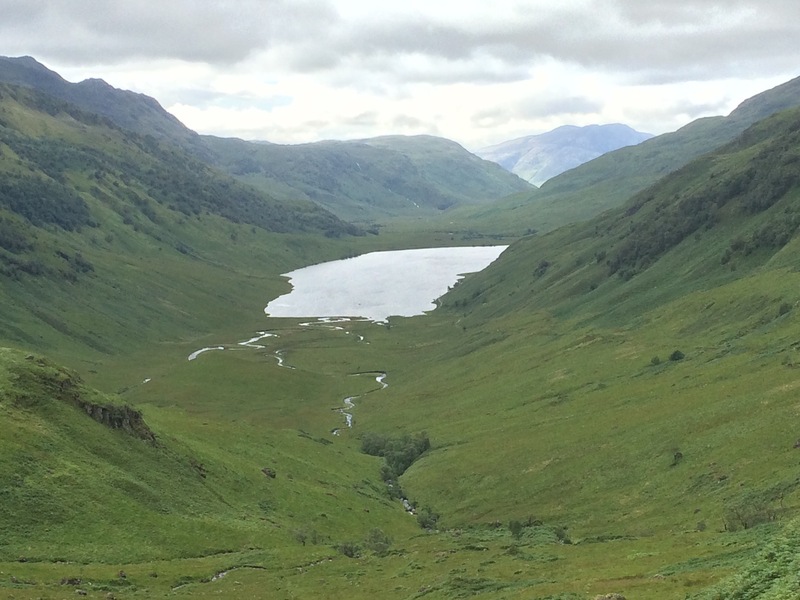 The first section followed a Land Rover track up the valley that holds the meandering Inverie River to Loch an Dubh-Lochain. Just as I exited a small wood there, on a hillock at a bend in the valley, was a memorial. It is certainly in a great spot even though it was put there by the hated Lord Brocket to commemorate his father. From the loch the path became a track that was very wet and occasionally became a stream. Nonetheless, it was a path and it led up Mam Barrisdale, a 450m col. I still couldn’t see many of the mountains but the view back down the valley was amazing and over the other side turned out to be just as good. As I walked down into Barisdale (the map has spells it Barrisdale and the signpost Barisdale – I’ve no idea which is correct) there were great views back up Gleann Unndalain (debates on how to spell Glen as well!) and along Glen Barrisdale. I still couldn’t see Ladhar Bheinn. There were some very strange large rocks on this slope; they looked almost like chopped tree trunks with their curves and rings. Is it a rock or a tree trunk? All of a sudden Barrisdale Bay came into view. The tide was out and I think the sand made it look even better. 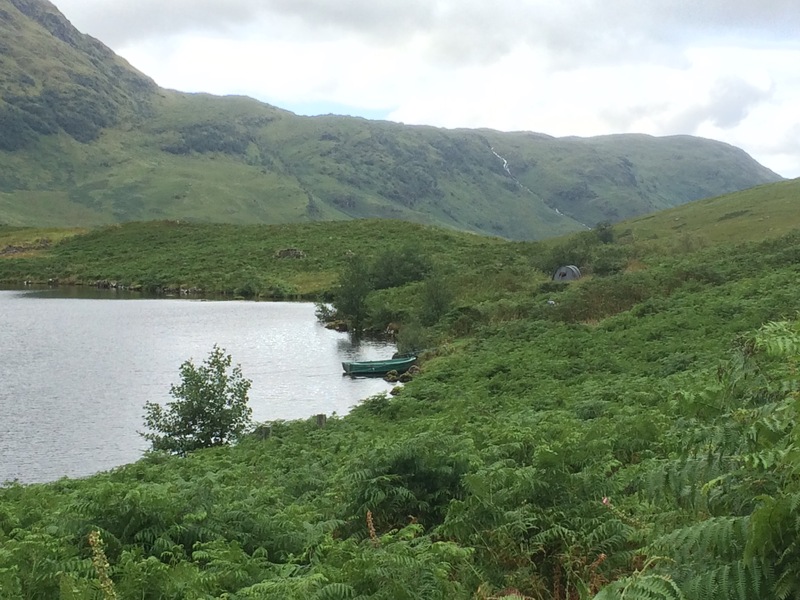 I had walked from the Loch of Heaven (Loch Nevis) to the Loch of Hell (Loch Hourn). 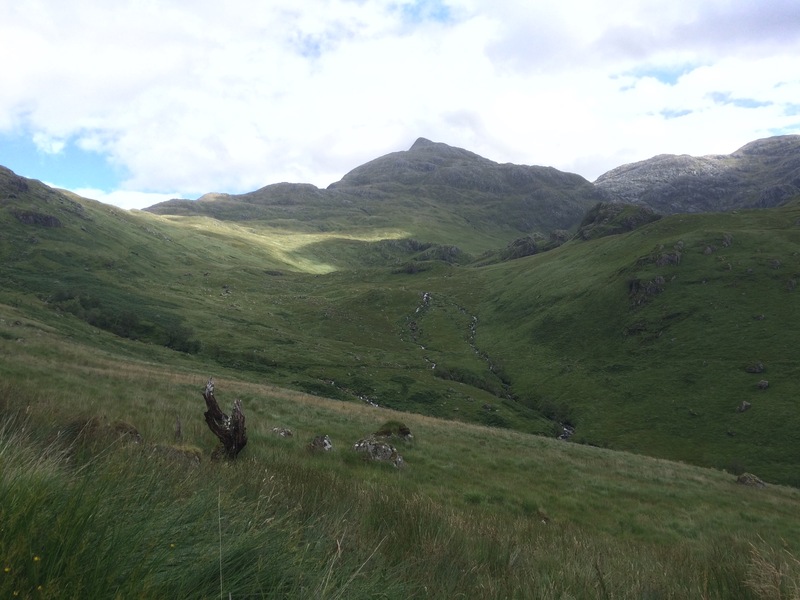 Both are very beautiful and help to cut off and border the Knoydart peninsula. There are no roads to Barisdale, but there are about 4 dwellings. I assume these people have boats, although I didn’t see any nearby. 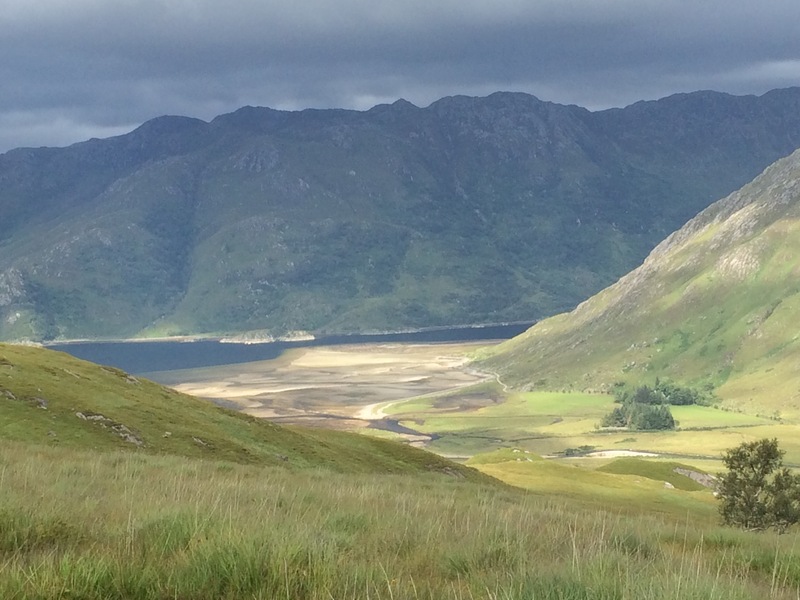 I did pass 4 people walking from Barisdale to Inverie and they were on a yachting holiday and had been dropped off to walk from Loch Hourn to Loch Nevis. Barisdale Bothy was empty when I arrived at 3 pm after a very leisurely walk. 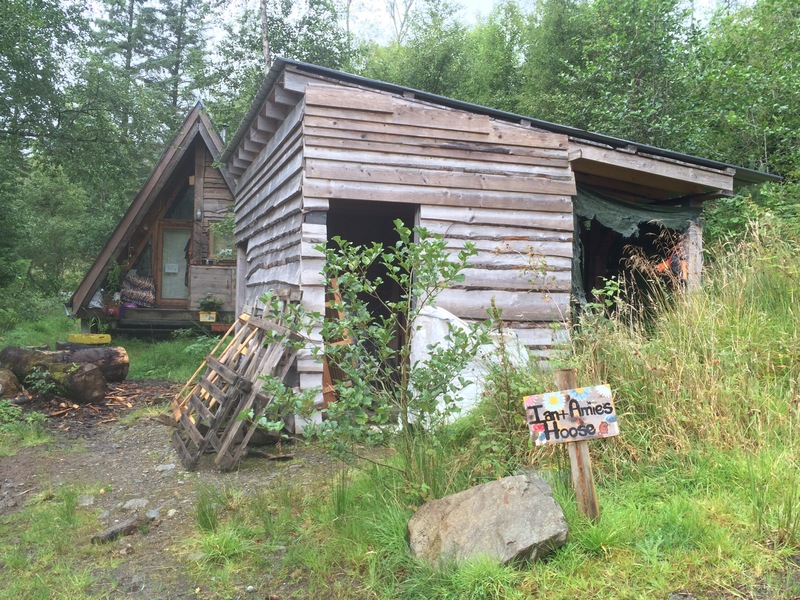 It had two 6-person bunk rooms and a living room with a table and chairs, and a sink with running water. There was also a toilet and basin; provide your own toilet paper. As there was no one else there I was able to enjoy a strip wash and launder my smalls (I am a clean freak I’ve decided). Dinner was chicken massaman with potato and rice (British Army rations – thanks Chris), a cereal bar and a cup of green tea (no milk required). Yum. 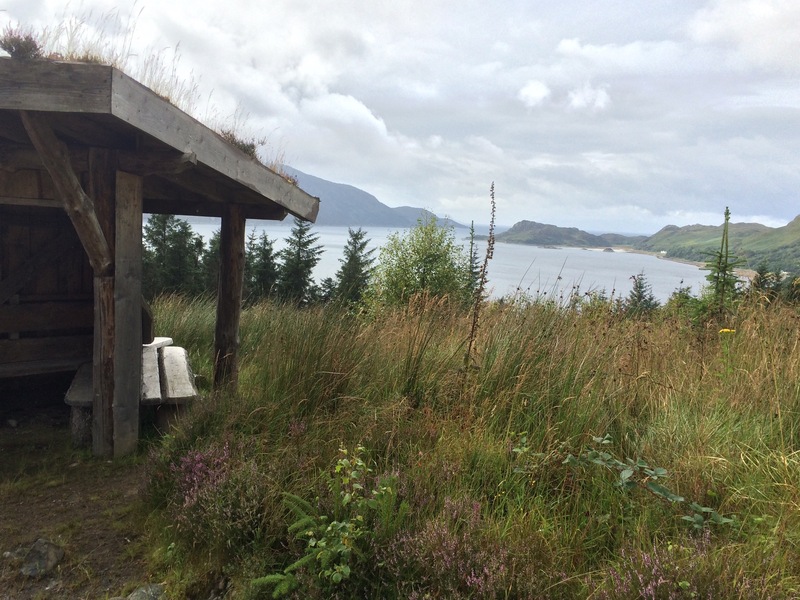 There was nothing to do, no phone signal or internet on Knoydart, and the midges were coming out so I settled for an early night and a bit of reading (am on to A Butcher’s Broom by Neil Gunn). At 8.30 two Czech guys arrived after walking from Shiel Bridge (where I hope to be in 3 days, albeit via a different route). They were soaked from the knees down and kept saying they couldn’t believe how boggy the land was and how difficult it was to walk with no paths. I sympathised!!! Despite an early night I didn’t get much sleep as have a bit of a cold and was coughing a lot in the night. I left Campbeltown fairly early with a thought that I would get the ferry from Claonaig to Lochranza on the Isle of Arran. 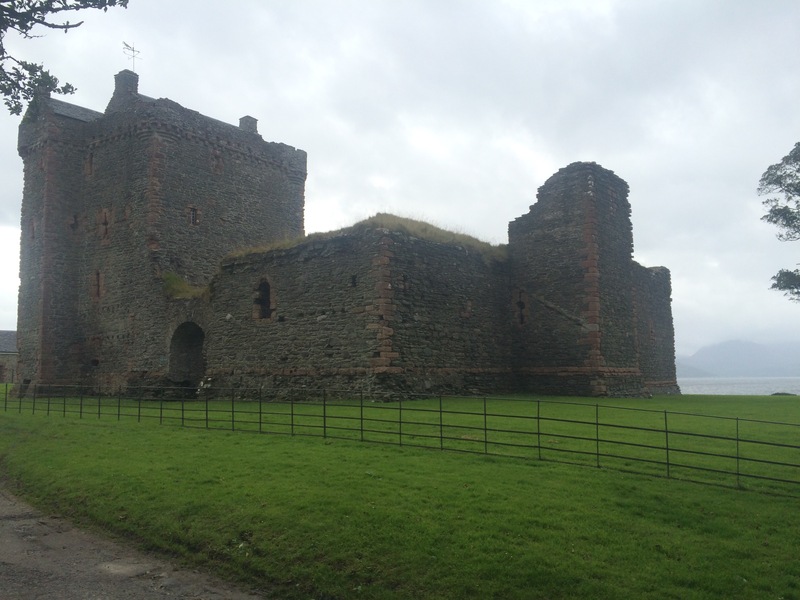 I was really early so I drove past the ferry terminal for a couple of miles to see the ruins of Skipness Castle. By the time I had walked around the grounds of this 13th Century castle and dodged a tractor on the road back there was a long queue for the ferry and not enough space for my car. Oh well, I wasn’t sure about going to Arran anyway as I couldn’t find accommodation and I wanted to climb Goat Fell but the weather was terrible (as usual) so the views would have been non-existent. I reassessed and instead carried on driving back up to Tarbert and caught the ferry across Loch Fyne to Portavadie on the Cowal peninsula. 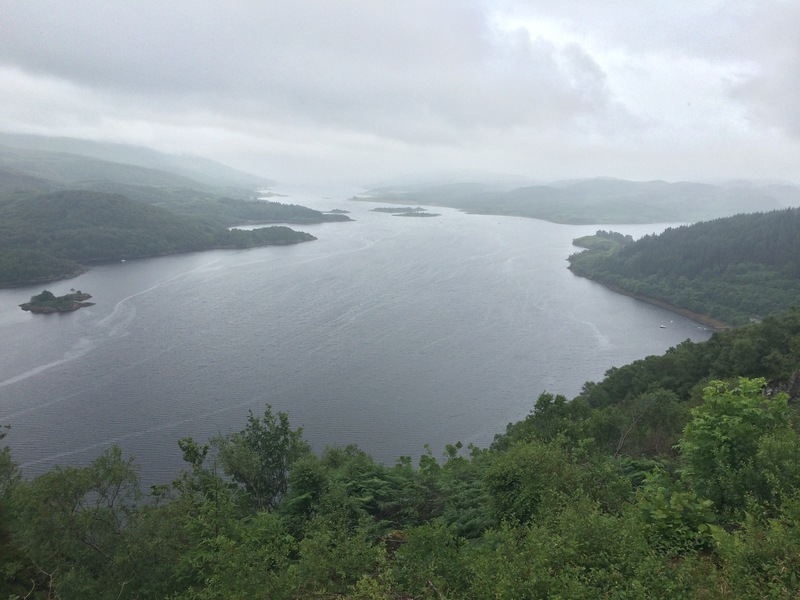 This is the heart of Argyll and there were plenty of clues that on any other day the scenery would be outstanding as there are 3 fingers to Cowal that are separated by 2 sea lochs, known as the long lochs. Then you have the lochs separating Cowal from Kintyre to the West, Inverclyde to the East, and the Isle of Bute to the South. No wonder Argyll and Bute has a longer coastline than the whole of France! There are hills, trees and water everywhere you look. If only there wasn’t so much rain and cloud! 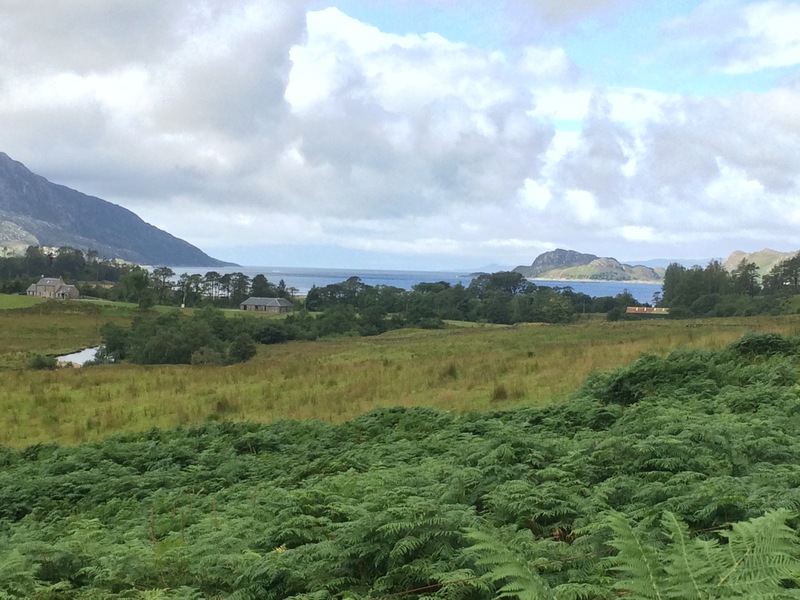 I drove up the West side of the Kyles of Bute and Loch Riddon, admiring the views whenever the clouds parted. I missed out the “middle finger” and drove around the top of Loch Striven and across to the Royal Burgh of Dunoon. 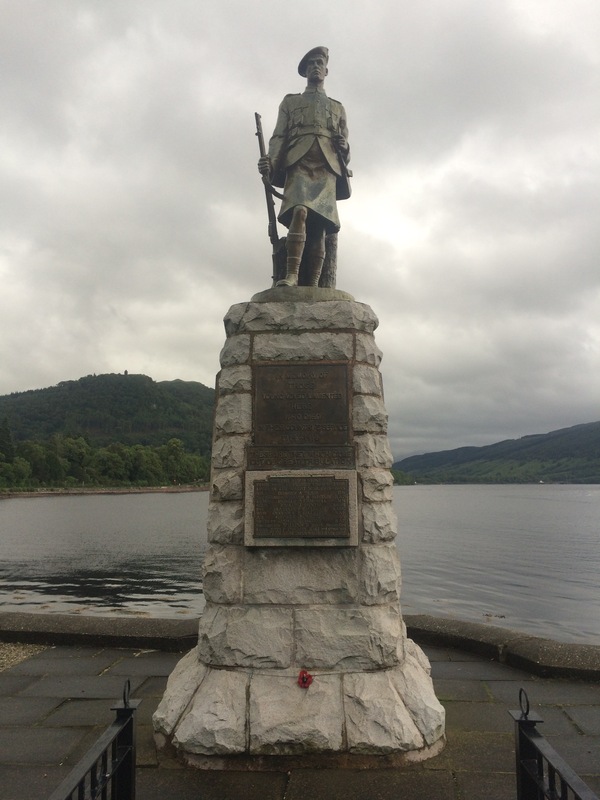 Loch Striven was where Barnes Wallis’ bouncing bombs were tested. 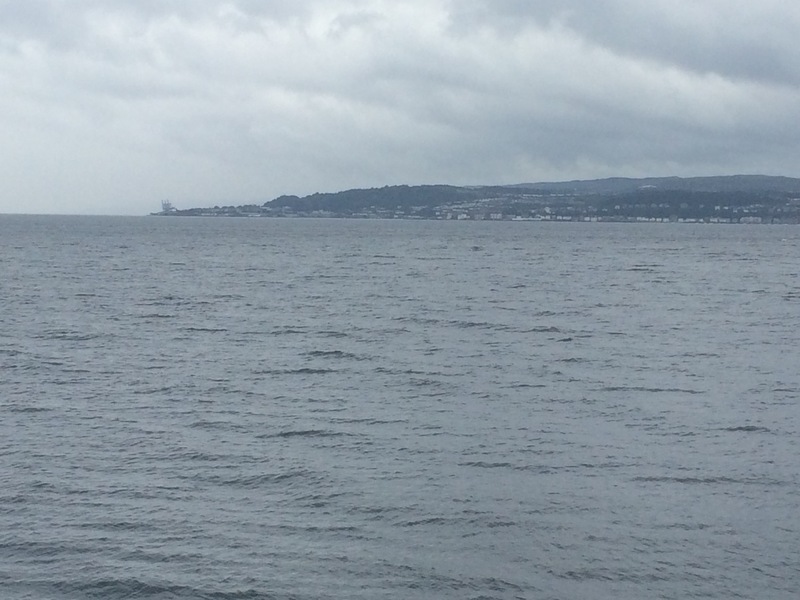 From Dunoon I got my first sight of Glasgow, across the Firth of Clyde, confirming that I was indeed heading to South Scotland now. 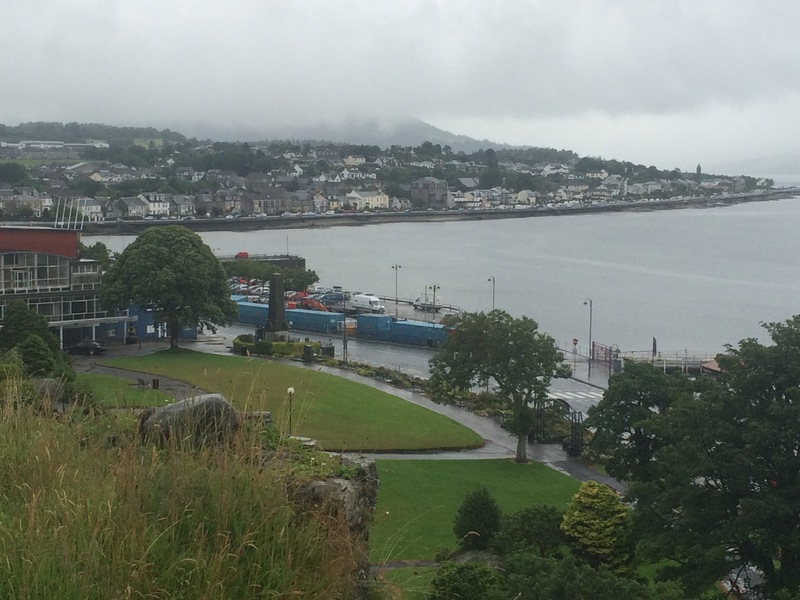 Dunoon was the first place that looked like a “seaside town” since Fife on the East Coast. I was almost excited. 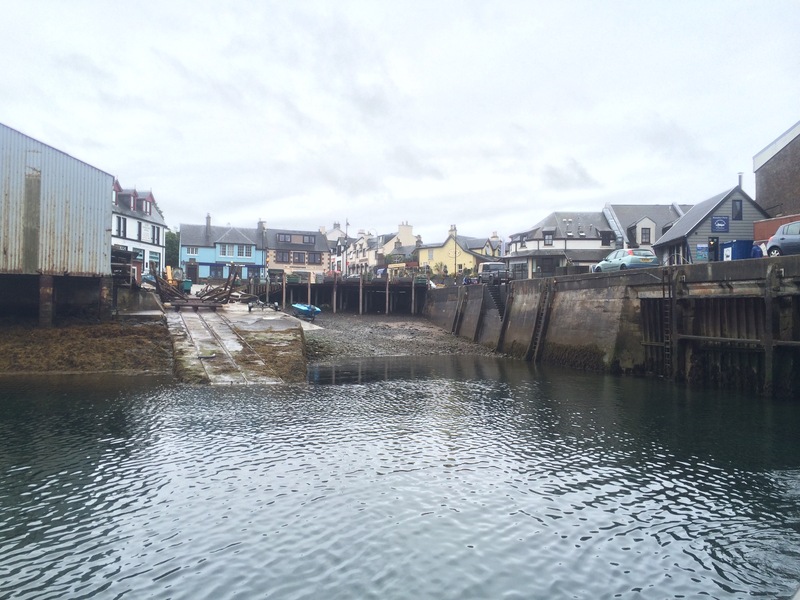 It certainly looked like a town that was once a Victorian seaside destination, with its promenade, pier and big old buildings. I climbed up Castle Hill but the views weren’t great with such low cloud. As I couldn’t really see much of the town I spent an hour in the rather fascinating Castle House Museum with its odd collections. On leaving the town I stopped for a quick coffee at one of the worst cafes I’ve been in – possibly a sign of the state of the town? From Dunoon I headed North around the end of Holy Loch and all along Loch Eck to reach the East side of Loch Fyne at Strachur. Holy Loch is so named because a ship carrying sacred Jerusalem soil bound for Glasgow Cathedral was wrecked here. It also has the distinction of being the training ground for the Cockleshell Heroes and was a Polaris Submarine base until 1992. It was the addition of so many trees, along with so much water, that made this afternoon’s drive different and spectacular. 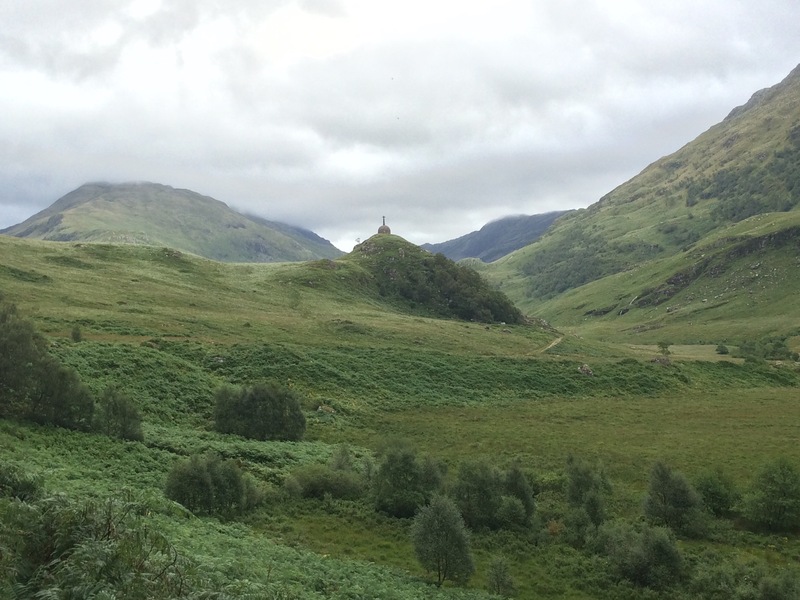 There were still lots of hills and mountains, and I went over a few as I criss-crossed between lochs. 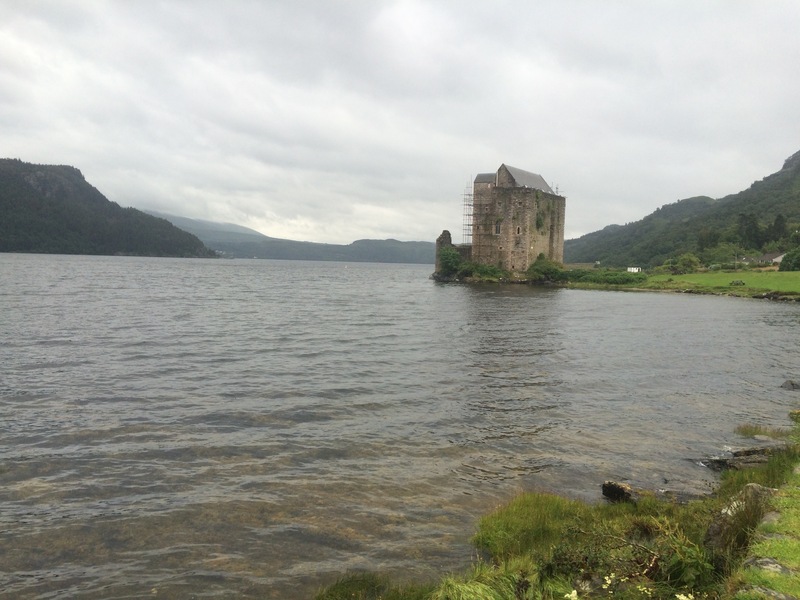 I headed back East to Lochgoilhead and drove down the dead end road alongside Loch Goil to Carrick Castle, yet another castle on a loch; Scotland has so many! 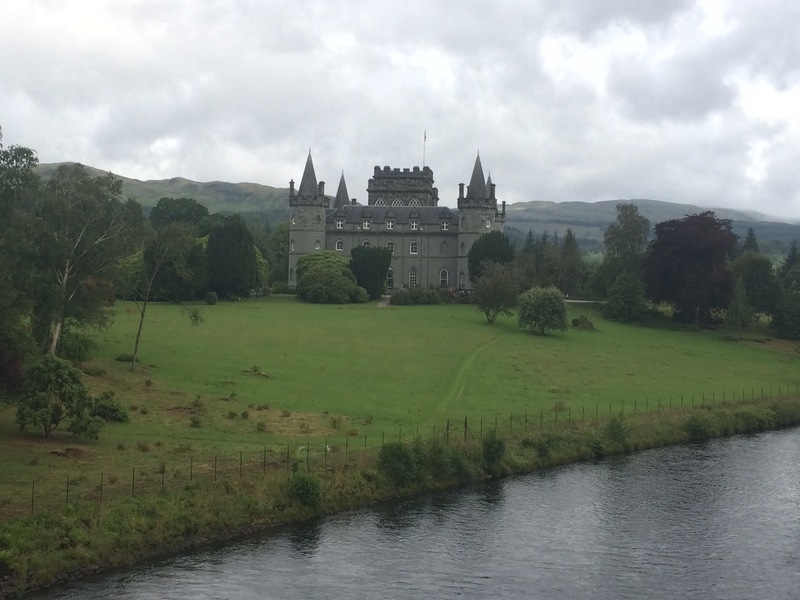 I didn’t fancy camping in the terrible weather and the only cheap accommodation I could find was the hostel at Inveraray. 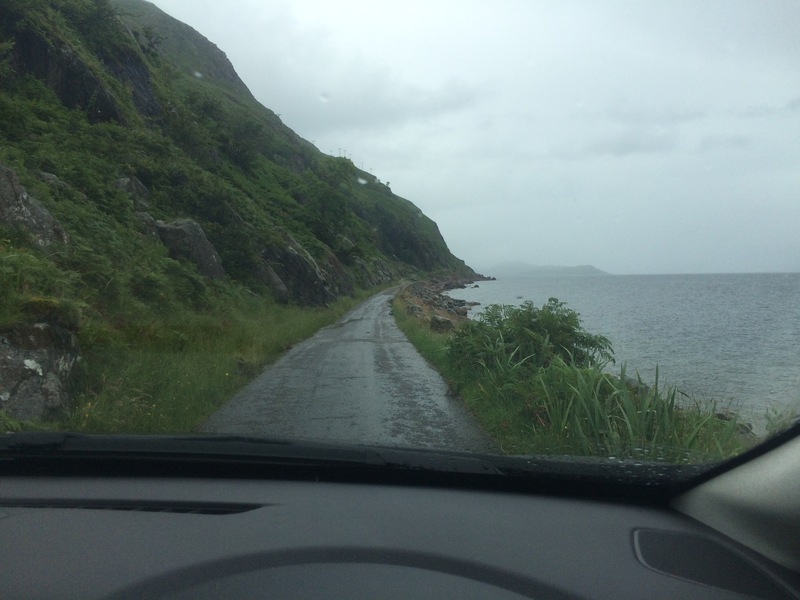 This meant driving back around the head of Loch Fyne, but it’s all so picturesque that it really wasn’t a chore. 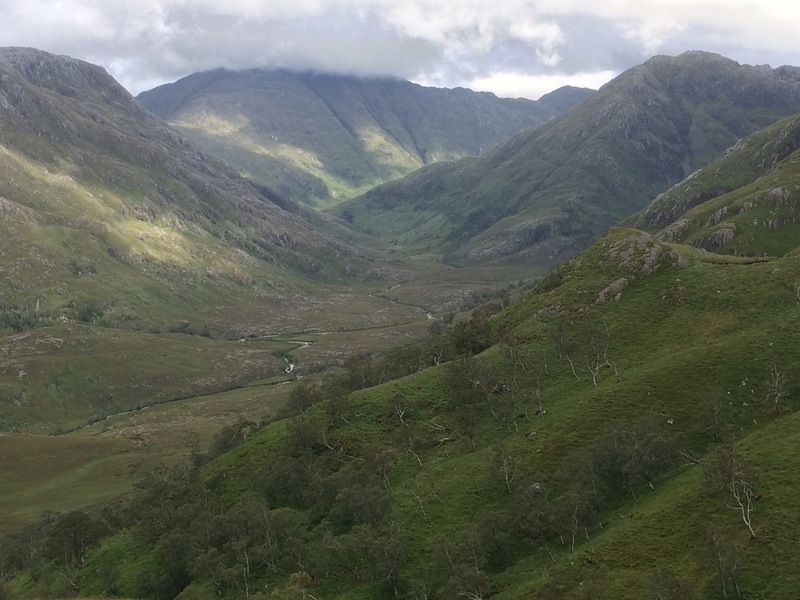 I particularly enjoyed driving over the A83 mountain pass called Rest And Be Thankful. I did indeed stop to admire the (obscured) view and was thankful for being in such a beautiful country. 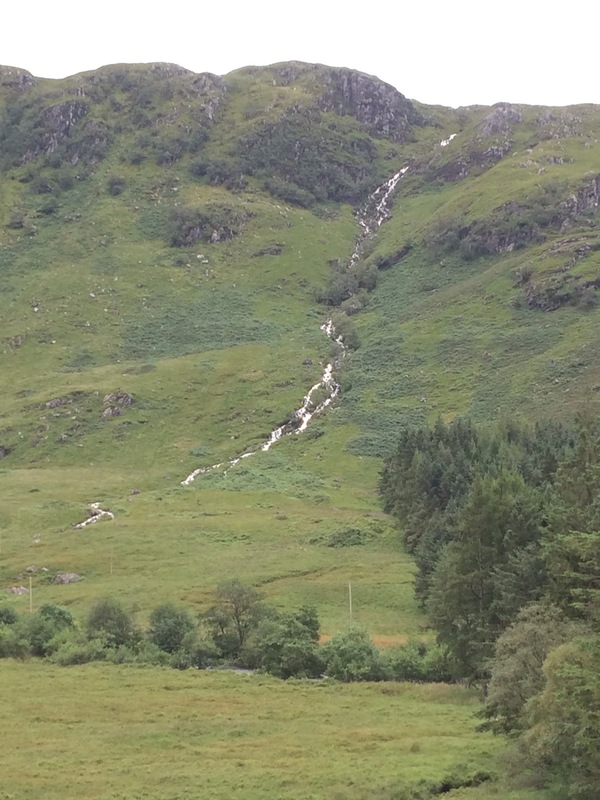 I was looking at 2 parallel roads: the A83 and an old military road cut into the hillside. Unfortunately I didn’t get a photo. 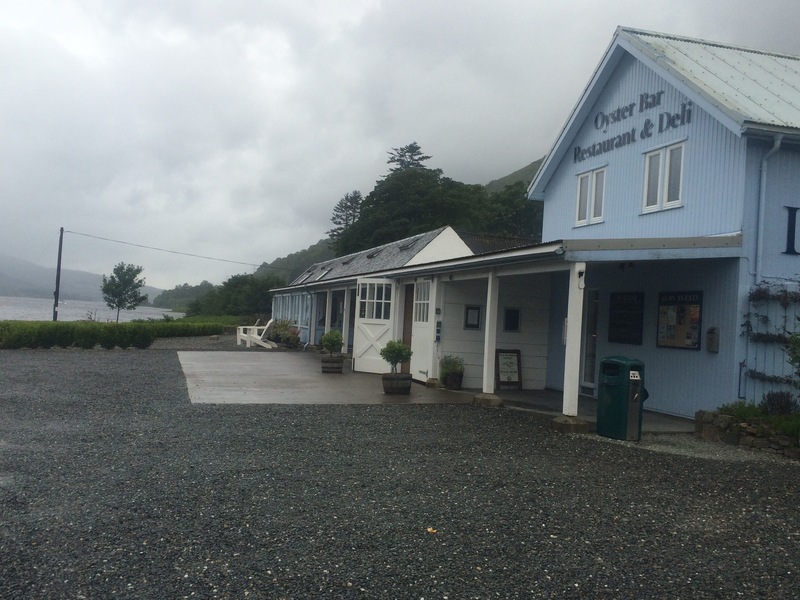 On the way back down Loch Fyne I passed the original Loch Fyne restaurant and oyster bar. It also had a seafood and deli shop that looked amazing. 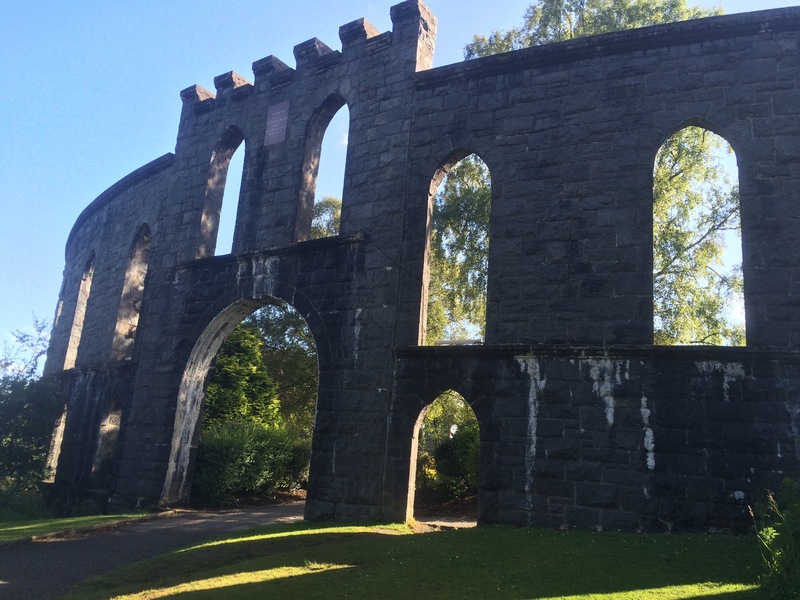 Inveraray was a surprise. I had no idea I was staying in such a fine example of an 18th Century Scottish new town. It was designed by one architect as an estate village to house the workers on the Duke of Argyll’s estate. Inveraray Castle is a Georgian mansion house just on the edge of the town and is the seat of the Campbells. 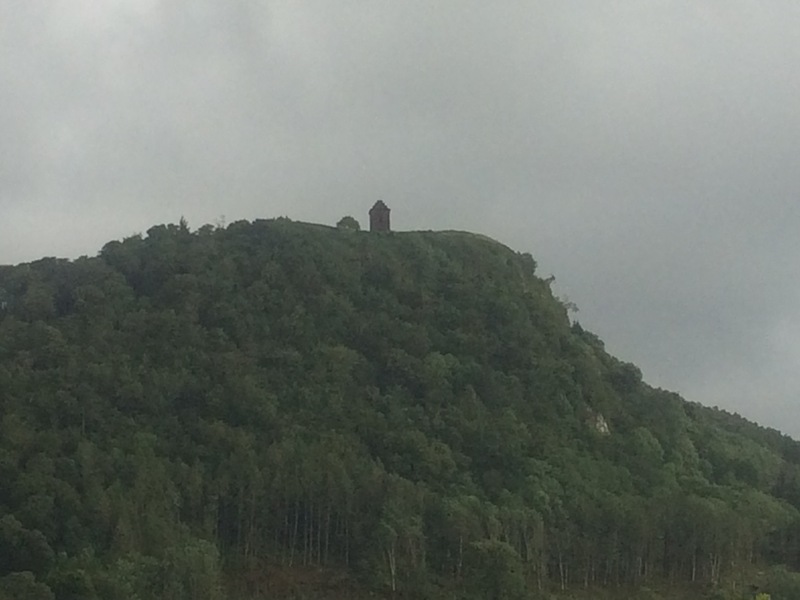 On the top of Duniquaich hill, overlooking Inveraray is a monument that is a prominent landmark. 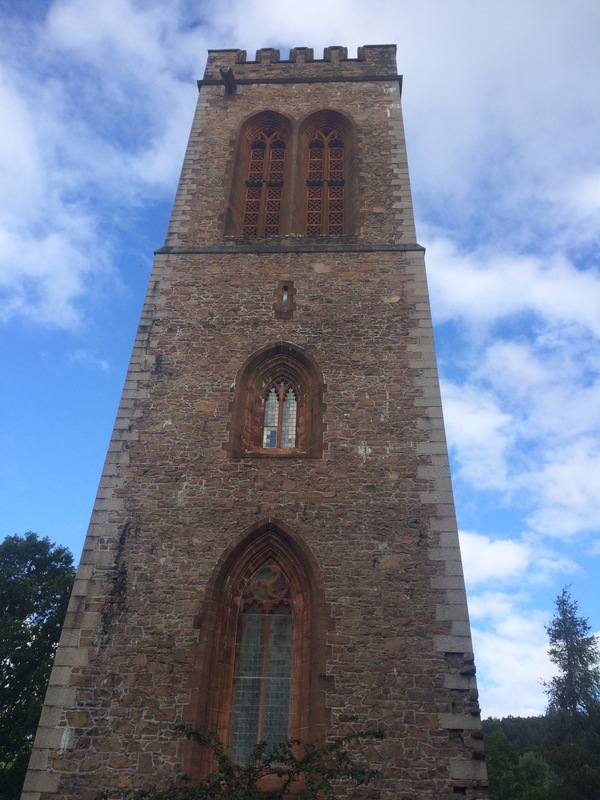 The town itself also has a jail (now open to tourists), an excellent bell tower that is not part of the church, and a wonderful war memorial. 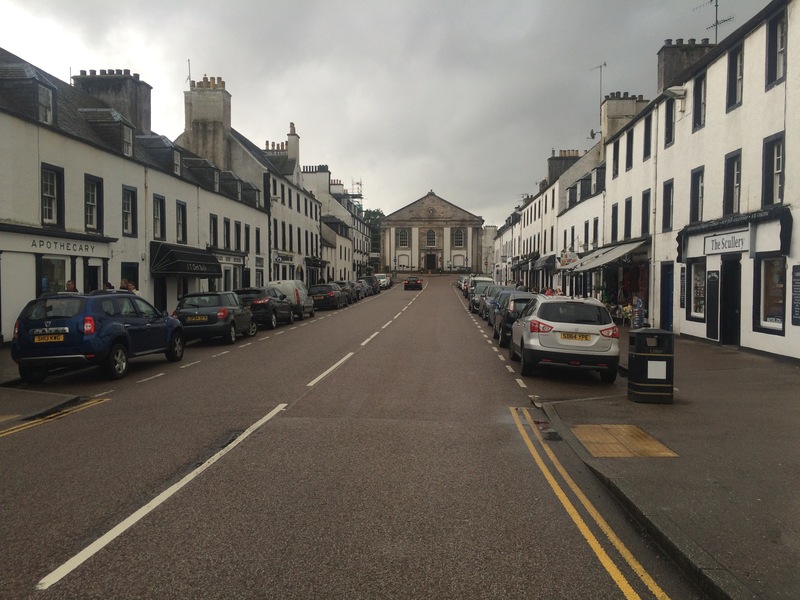 Inveraray is clearly a popular stop on the tourist trail and I quite liked it. 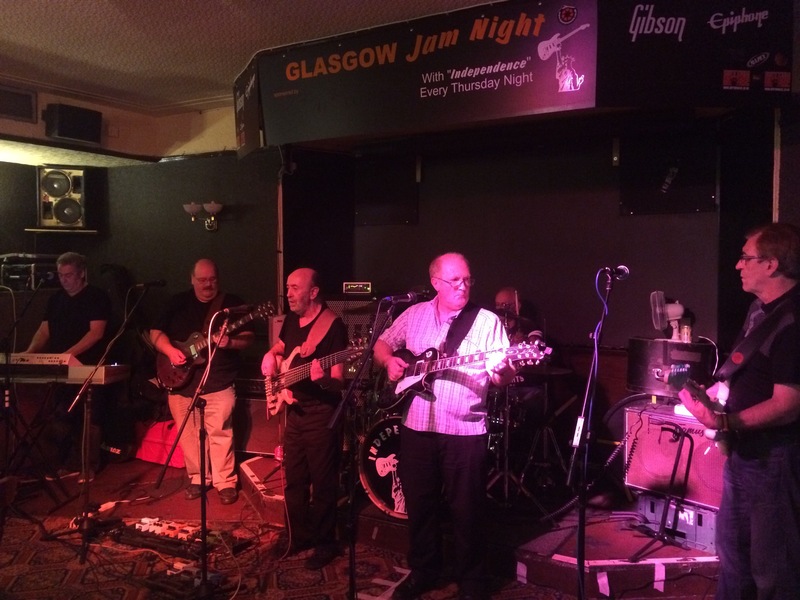 I went for a nice dinner at The George Hotel and hung around to listen to the live band playing traditional Scottish music afterwards. It was a good evening. Not a bad night’s sleep on the floor of the ferry office. I was treated to tea and an apple turnover for breakfast while waiting for the ferry and chatting to the ferry drivers. Heavy rain was forecast and it was coming in waves but fortunately the crossing was eventful. There were 2 Air Force officers from Lossiemouth on my ferry, heading to Inverie for the weekend. Oh those were the days! 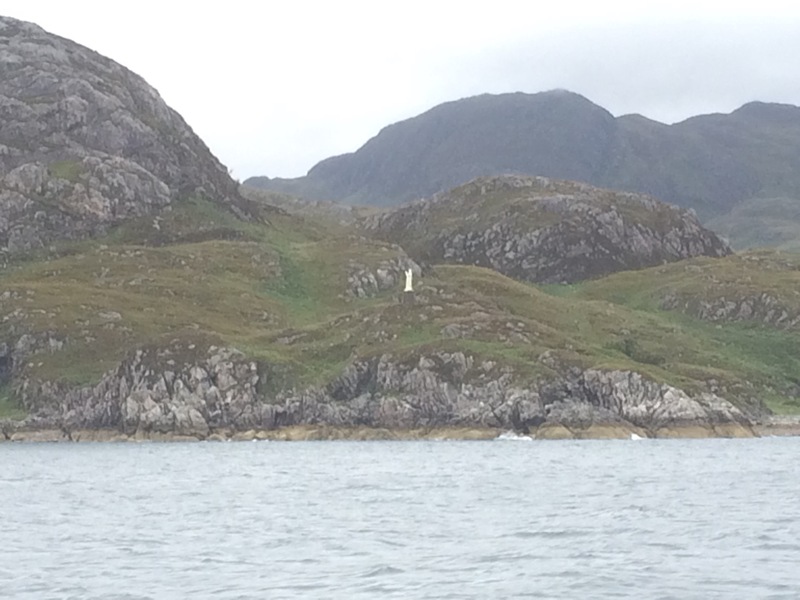 As the ferry approaches Inverie Bay, having crossed Loch Nevis (the Loch of Heaven), it passes a strange, and large, statue of a Madonna on the Rubha Raonuill headland. 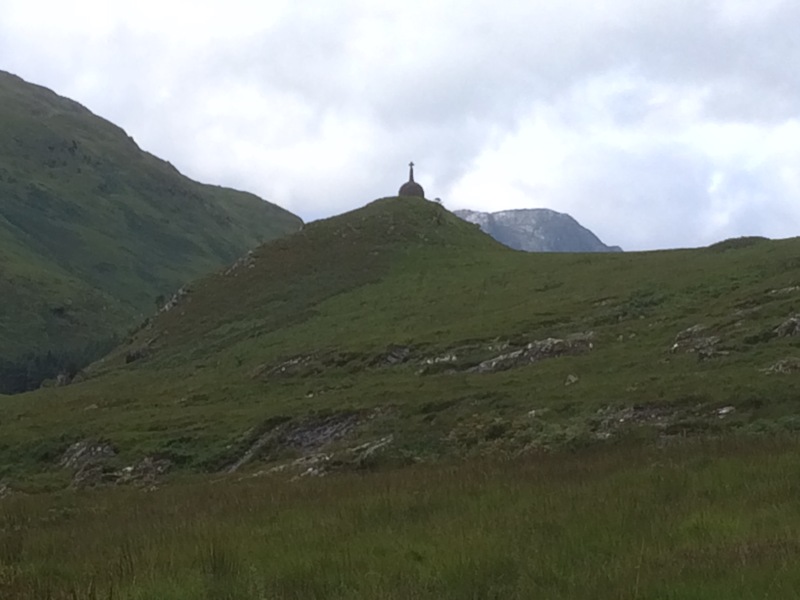 The Madonna of the Highlands? 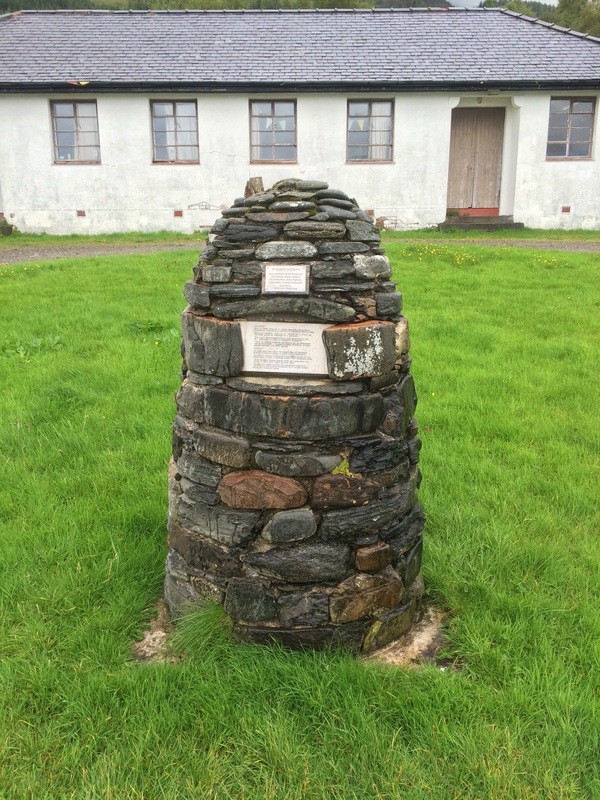 Inverie is a small town, population about 100, and the capital of Knoydart. 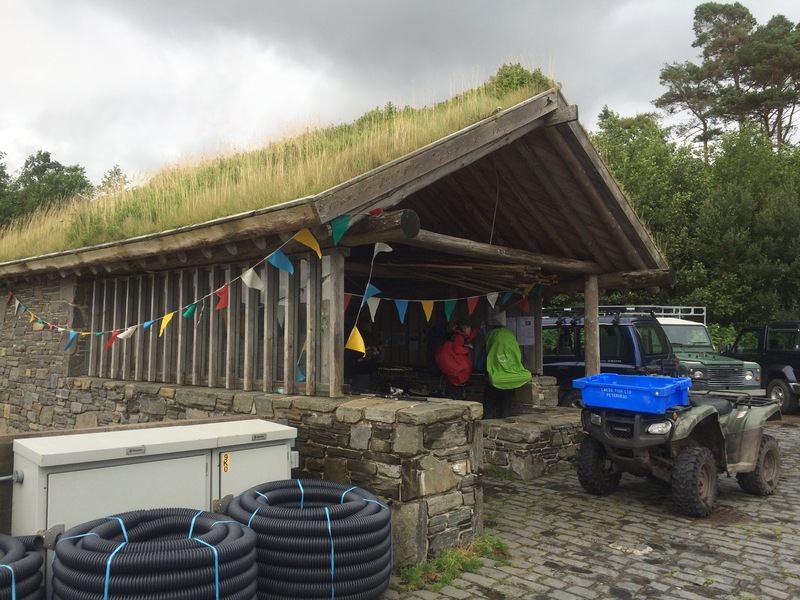 I was impressed by the effort that has gone into the community, starting with the home-built ferry terminal building (a wooden hut) that is a welcoming sight on a rainy day. There were a line of land rovers parked outside it – I think everyone has one to get about the 7 miles of road around Inverie that is not connected to anywhere outside Knoydart. Truly remote. 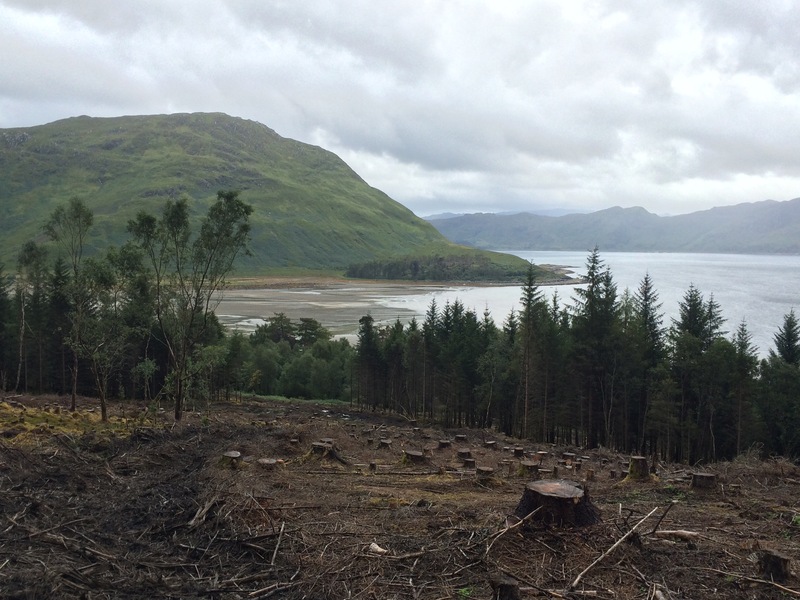 The Knoydart Foundation was set up and bought the land for the community in 1999. There is lots of information on the struggles with landowners in the Ranger’s office. The most notorious landowner was Lord Brocket, a Nazi sympathiser, and apparently Hitler was a visitor at Inverie House in 1937. The rain was on and off all day but I managed to walk to the campsite and put my tent up without getting soaked. I did have to duck into the tea room to avoid one heavy shower on the way but that wasn’t a hardship. I went on a short walk around the town and up the hill to the viewpoint. 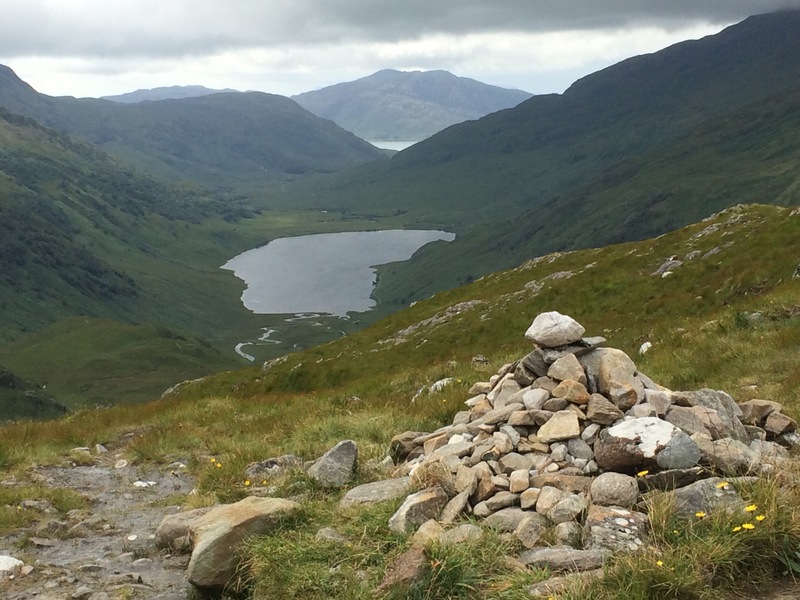 Knoydart has 3 Munros but there was no point in tackling one for the views today as they were invisible in the cloud. 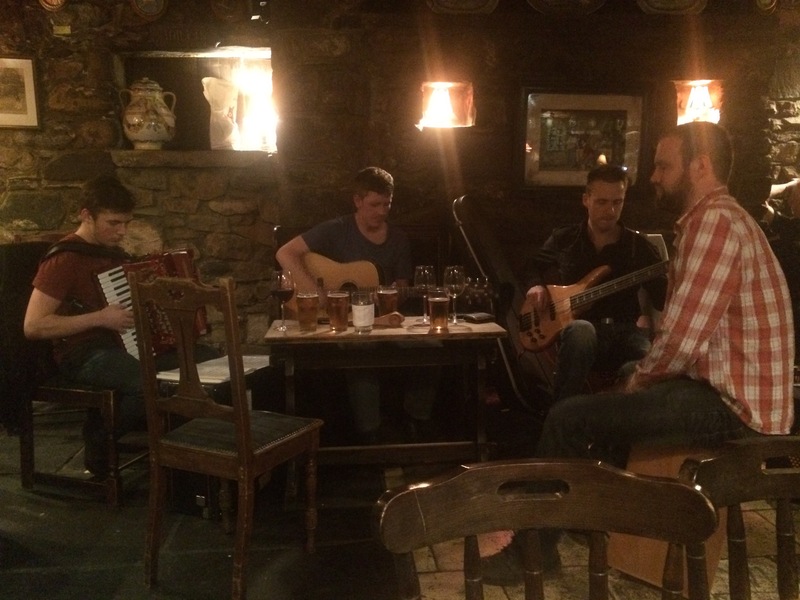 I settled in Britain’s remotest pub for the afternoon and evening and was joined by a bunch of musicians who were having a traditional music jam session with their accordions, flutes and whistles. There is a lovely feel about this small community; there clearly is a vibrant community here. Hydro electricity powers the town and they are keen on all things ‘green’ (the campsite has a compost toilet). There are some wondeful-looking tourist houses, with great views and hot tubs. I am content with my tent by the beach, although I won’t be taking advantage of the fire pits and ready-chopped wood as it’s unfortunately not dry enough to sit outside for the evening. Fortunately I phoned ahead to book dinner in The Old Forge pub as it gets very busy. For £4 I can get a shower here too. With 4 days in the wild coming up I think I’m going to take advantage. I didn’t get to sleep until after 1 am as that’s when the bar downstairs closed. I did not enjoy being cramped in a small room with 5 blokes so was up very early after a poor night’s sleep. The room stank of sweaty men and I needed to get out of there. Guess what…it was raining. How unsurprising! My only plan was to get to the Mull of Kintyre. I had bought a road atlas yesterday as I’ve run out of maps; this means I am unlikely to be doing much walking now without OS maps to scrutinise for walks to do. Still, in this weather I’m happy just driving to be honest. The poor weather meant the views of the islands in the Firth of Lorn (Scarba, Lunga and the Garvellachs), and later across the Sound of Jura to the islands of Jura and Islay, were not what they could have been. From Oban I drove down to Easdale, the town at the end of the Isle of Seil, which is attached to the mainland by the Clachan Bridge. 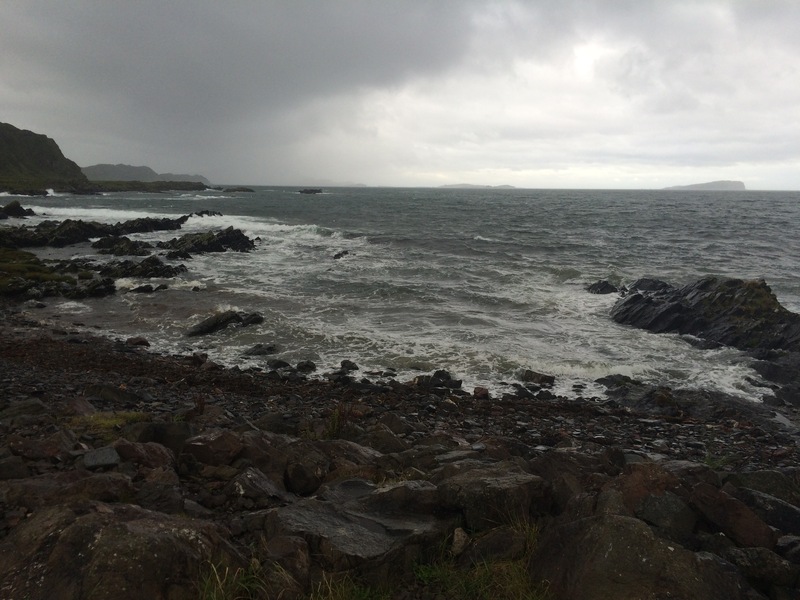 From Easdale there are views across the Sound of Insh to Insh Island and the Firth of Lorn to Mull. I didn’t bother stopping again until I reached Kilmartin, the main town in the beautiful Kilmartin Glen, which opens out onto Moine Mhor. This was a gem of a place with a great little museum giving an insight into the rich archaeological history that is visible all around this valley. 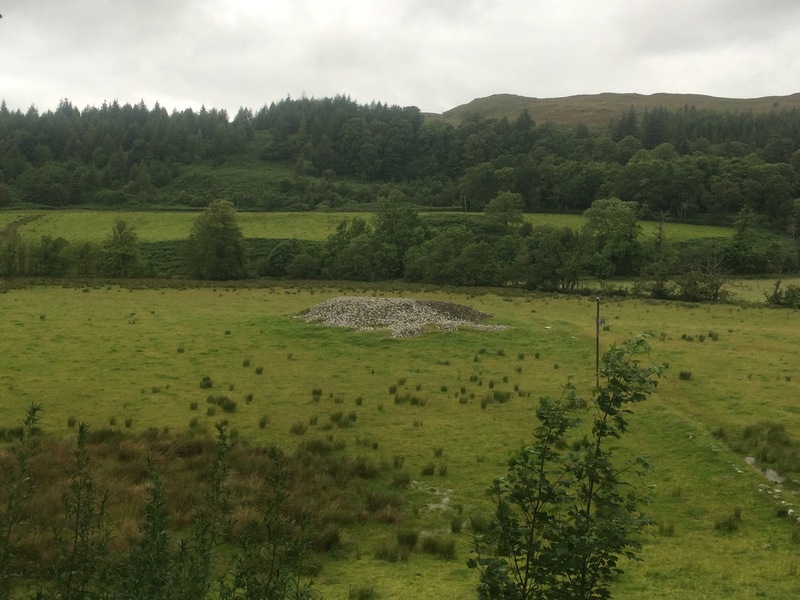 There is a line of stone cairns running along the valley, standing stones, fort remains and various cup and ring marks that one could spend days looking at it all. 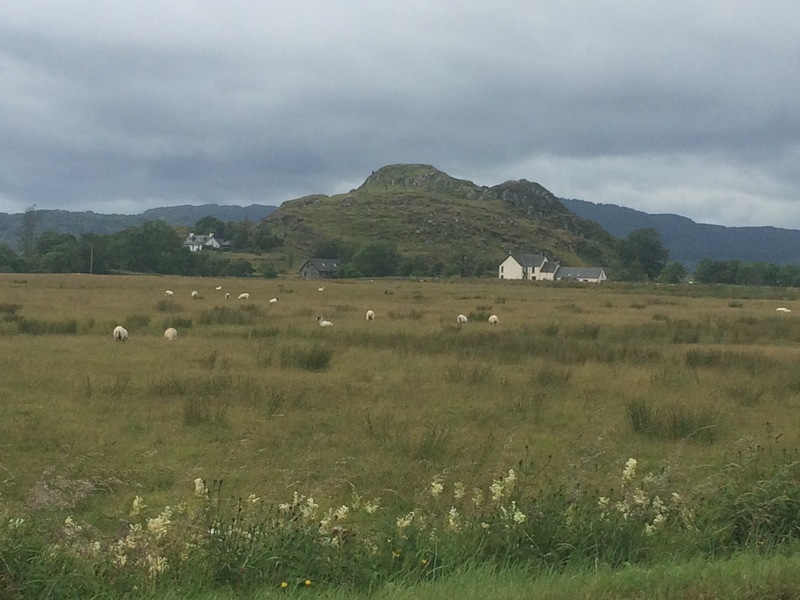 I think Kilmartin Glen and the raised peat bog of Moine Mhor have the largest concentration of historical places and monuments that I’ve seen. I spent a couple of hours in the excellent little museum at Kilmartin, which also has a nice cafe. The Kilmartin church had some crosses that were similar to the Pictish crosses on the East coast, but Celtic. I really enjoyed the drive across the Moine Mhor peat bog as it was such a different landscape – a wide open low lying area on the edge of the mountains. In the middle of the Mhor is a lump of rock with the remains of Dunadd Fort on top. This is the hill where St Columba came to anoint Aidan as first Christian king of Scotland in 574. So much history! 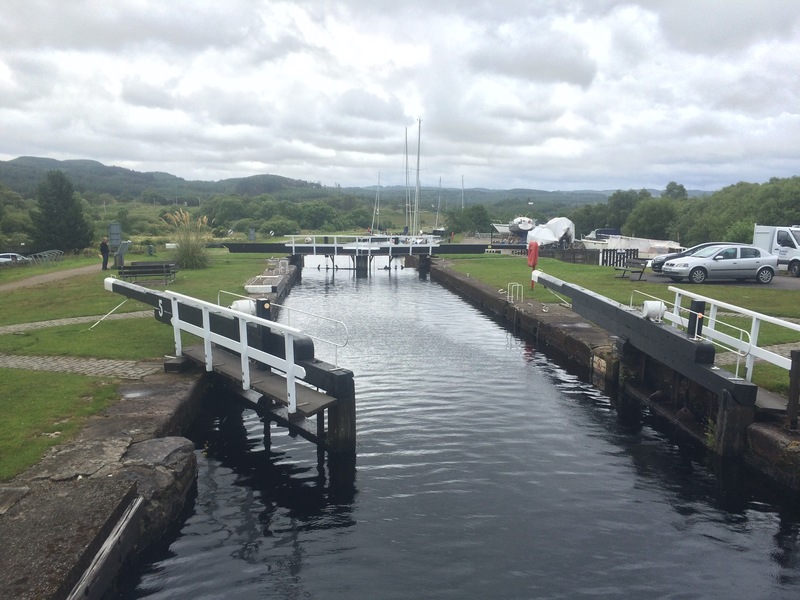 Next stop was Crinan and the entrance to the Crinan Canal. The road followed the canal for a bit and I was able to see a few of its 15 lochs and 7 bridges. 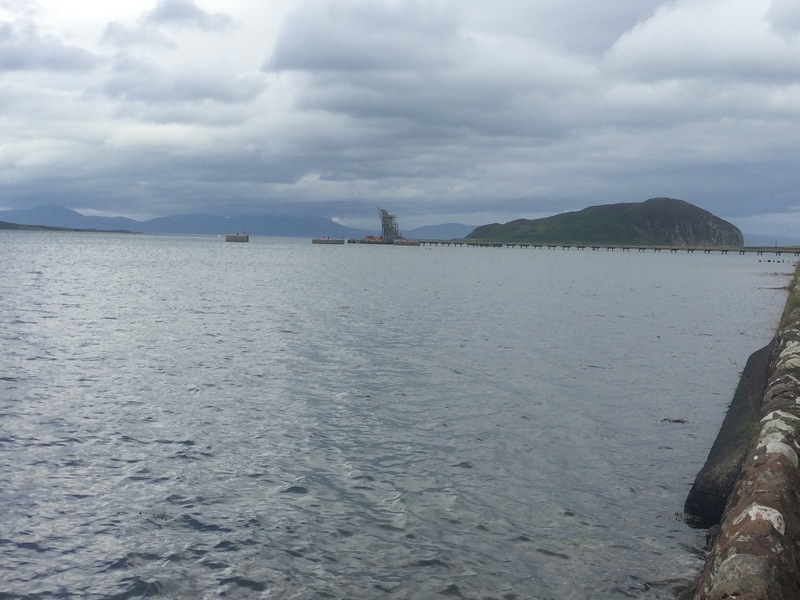 The canal was built in 1801 and handily links the Sound of Jura with Loch Fyne, thus eliminating the need for boats to go all the way around the Mull of Kintyre. 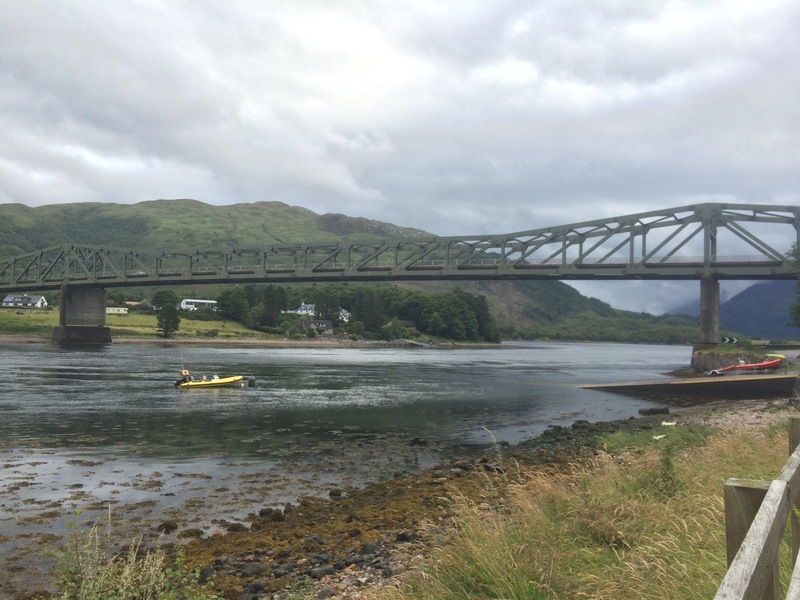 The canal is now part of the Argyll Sea Kayak Trail that goes from Oban to Helensburgh. 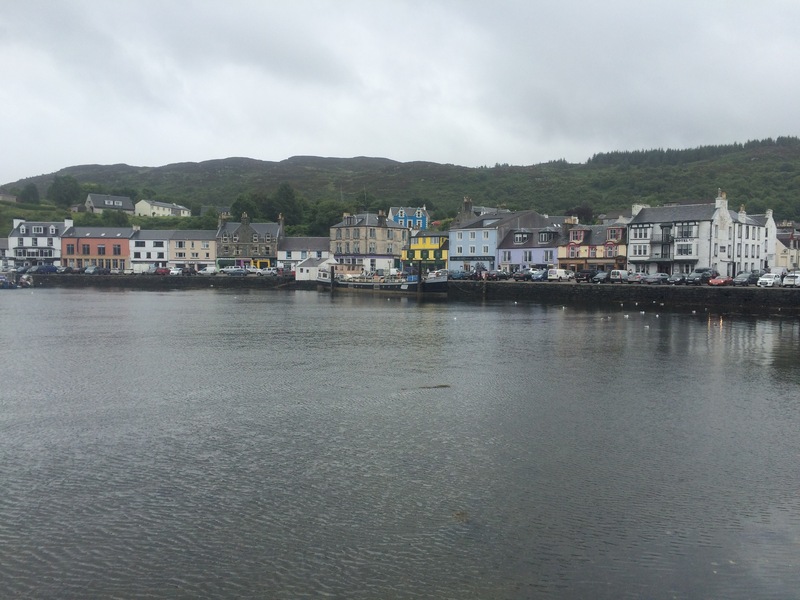 I drove on to Lochgilphead and across Knapdale to the pretty little town of Tarbert, at the entrance to the Kintyre peninsula. 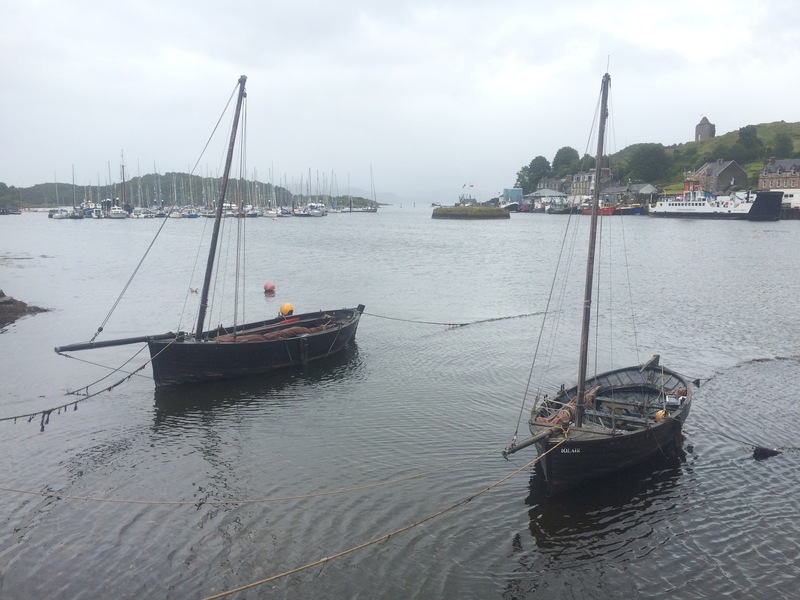 It was raining quite hard by now but I stopped briefly to admire the harbour and, in particular, a couple of Loch Fyne skiffs that were moored up. From here I drove down the West side of Kintyre and could just about see across to Jura and Islay; the Paps of Jura were faintly visible through the rain and cloud. The paps of Jura are there somewhere! I thought I ought to check out the old RAF Machrihanish, which now serves as Campbeltown Airport. The road to the Mull of Kintyre skirts around the end of the runway. Kintyre felt like the Wild West to me. 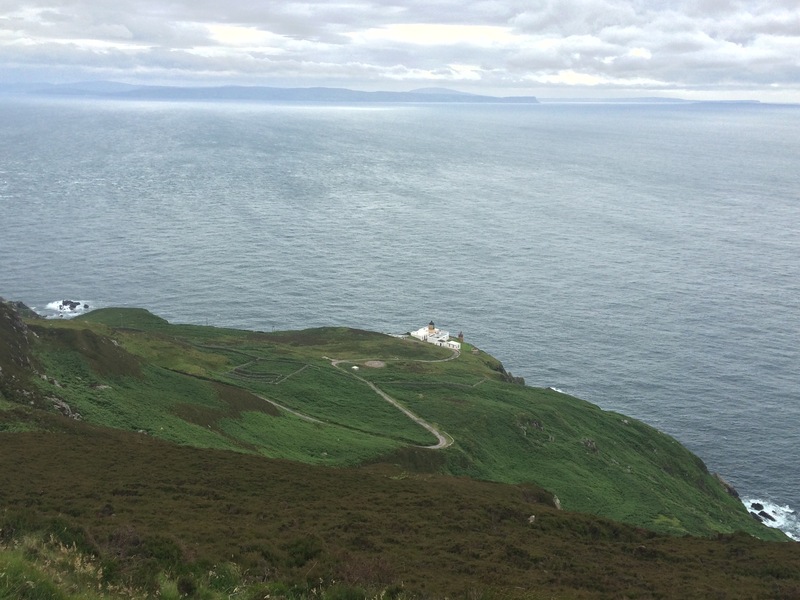 It definitely had a really remote feeling and the drive to the Mull of Kintyre lighthouse was single track, up and down, with a couple of gates to open on the way. 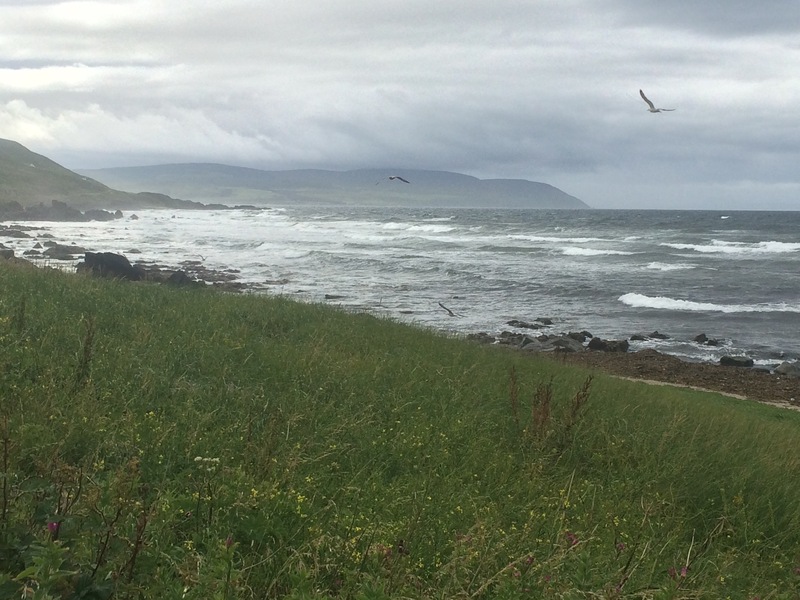 Kintyre was the heart of the Dalriada Kingdom, started by the Gaelic speaking Scotti tribe from Ireland around 300AD. I was surprised to see a couple of very remote houses; I wonder who lives out here and how they do their shopping? Once I arrived at the final, locked gate it was time to abandon the car and walk down the steep hill towards the lighthouse. I didn’t bother going all the way down and gave up about halfway, after about 4 hairpin bends. Despite the grey day I could see Northern Ireland really clearly; it’s much closer than I thought. 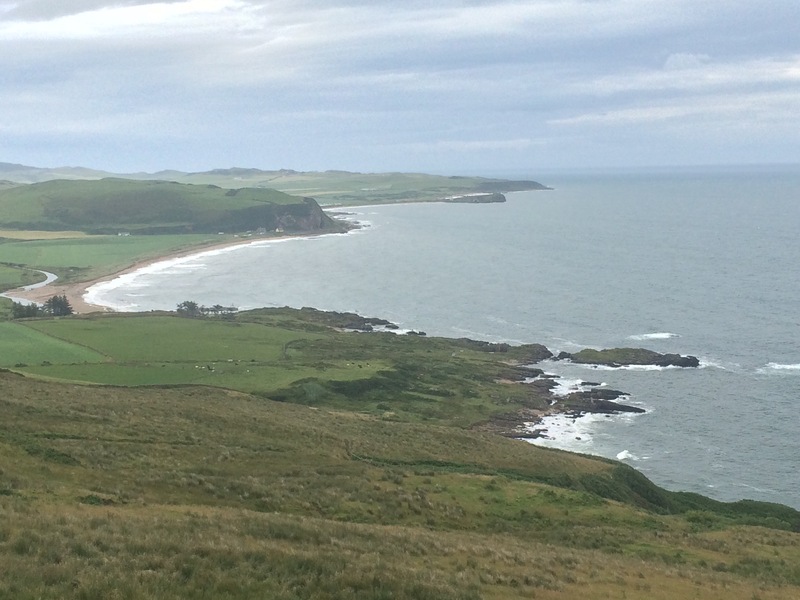 I wended my way across to Campbeltown via Southend and the road that hugs the rugged coastline. 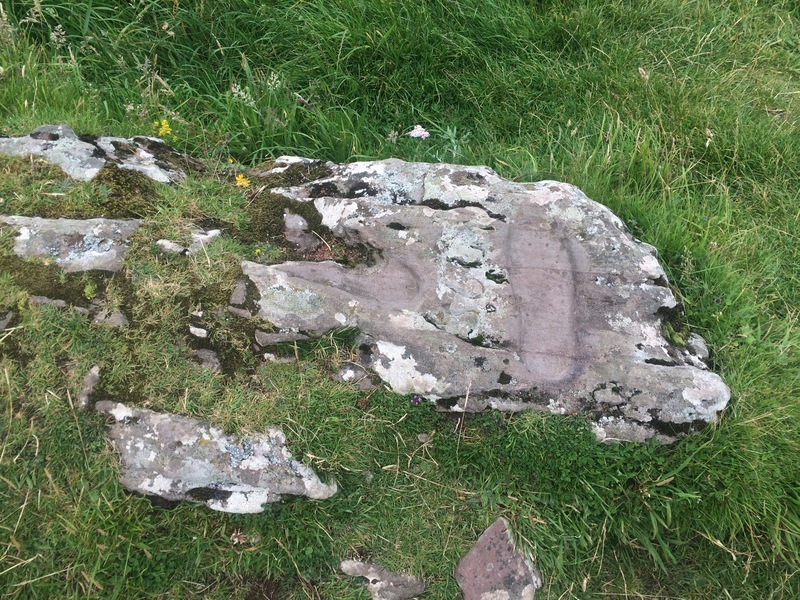 I stopped on the Southern bit to look at Keil Caves, once inhabited, and to see the footprints in a rock. Apparently these belong to St Columba and signify the spot where he landed in Argyll when he came from Ireland to bring Christianity to the Picts. I arrived in Campbeltown early evening and made my way to the Campbeltown backpackers. It works on an honesty payment system (put the fee in an envelope and post it in a box) and there were only 2 of us staying the night, me and a journalist who works in the town but is waiting for a house. Unbelievably this guy came from Fairfield, about 5 miles from where I am from, on the outskirts of Birmingham. Shame I didn’t like him! He did recommend the Ardshiel Hotel for a nice dinner. 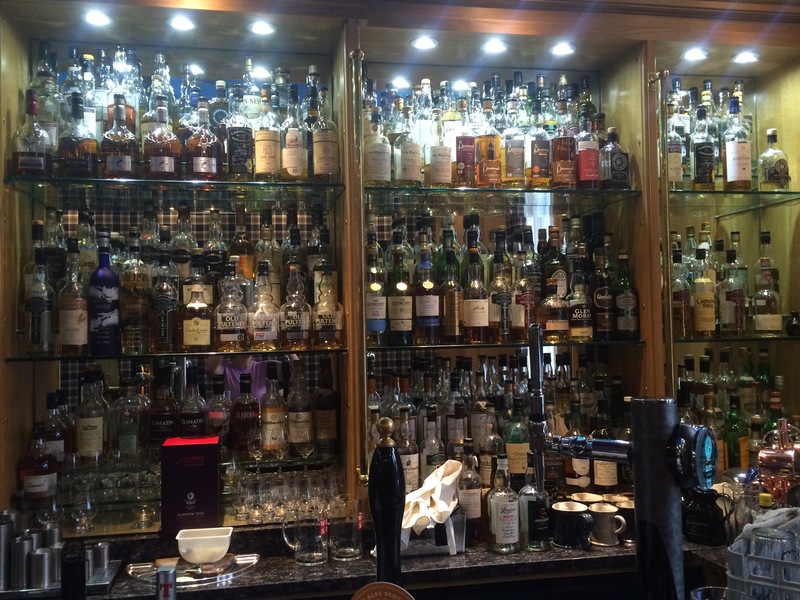 Their whisky bar looked amazing…if you like whisky! I learnt that Campbeltown used to have 17 whisky distilleries and Paul McCartney used to have a place here (hence the song). These days the town looks a little rundown. Having driven home in a hire car and had a couple of weeks off I needed a new plan. As I was already booked to go to Skye for a holiday in a campervan in September I developed a plan around that. 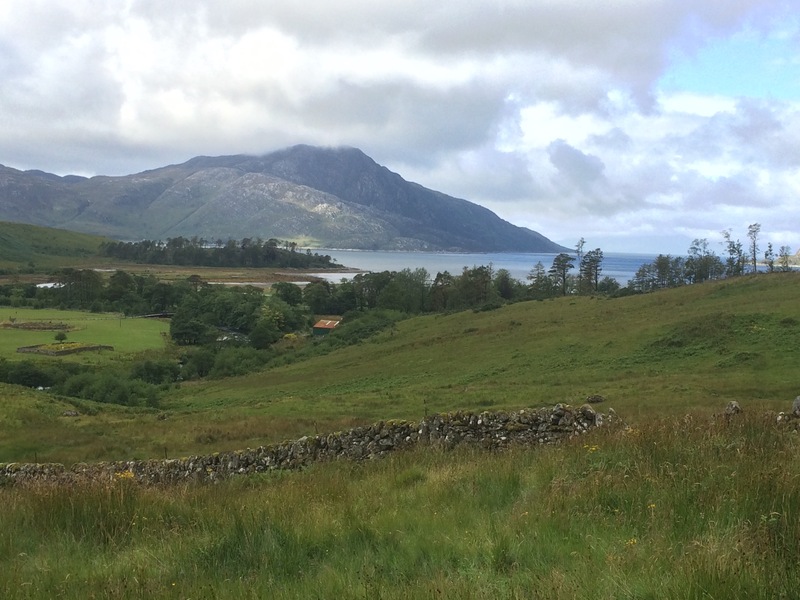 The thing about driving was that I missed out Knoydart as the only road from Kyle of Lochalsh heads inland to Fort William and back out to the coast at Mallaig. 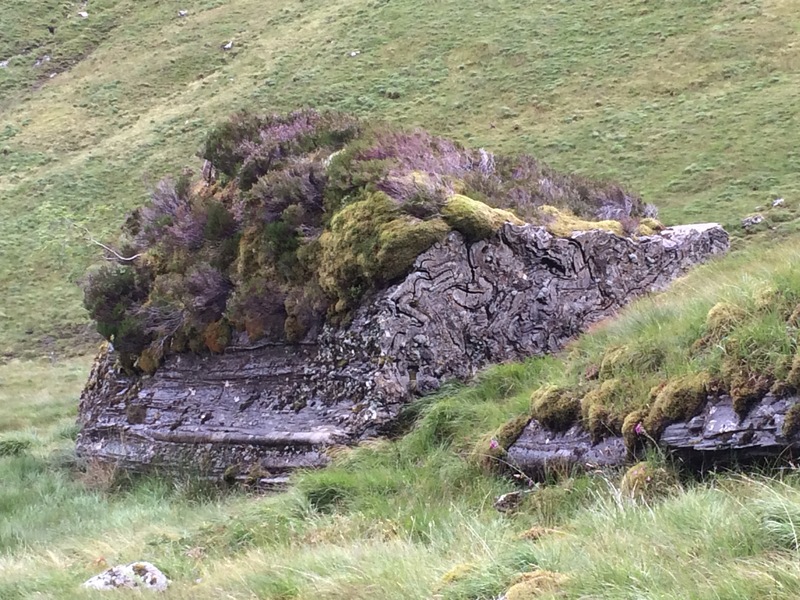 I figured I could walk this remote section as part of my trip back to Skye. 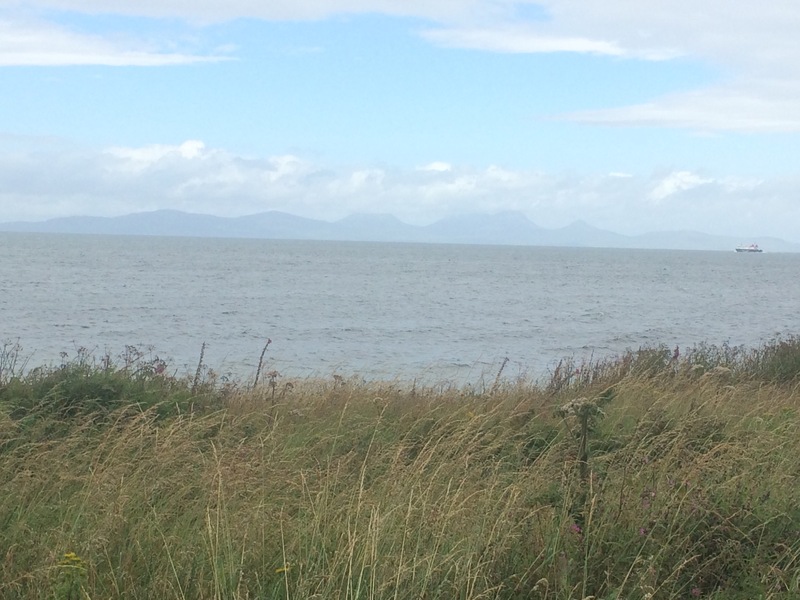 Then after a holiday on Skye I would return to my finish point in Dumfries and Galloway, somewhere around Wigtown. The plan was formed, all I needed to do know was to read Ring Of Brightwater by Gavin Maxwell and my preparation would be complete! It was raining again when I left the bunkhouse and headed just down the road to the Fishnish ferry terminal. 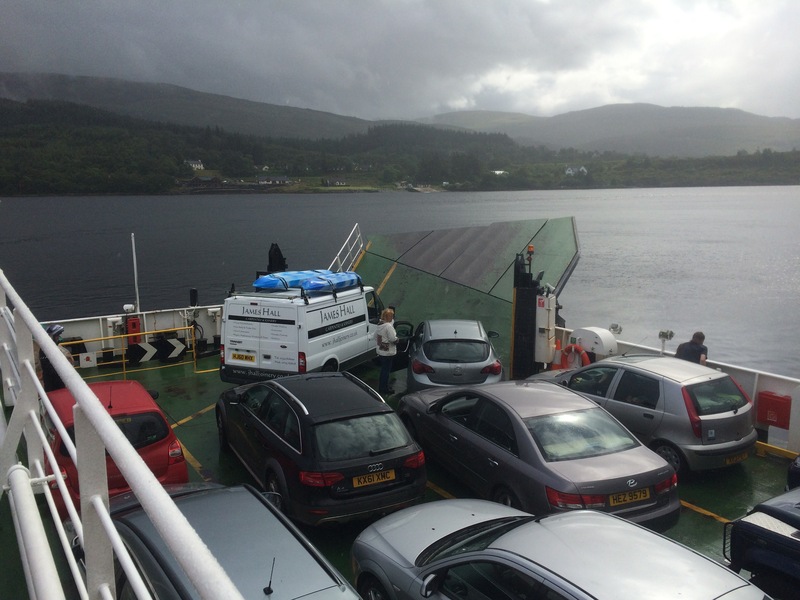 I think this is the smallest and quietest ferry terminal on Mull and so I was in one of only 4 cars to board the ferry to Lochaline. Back on the mainland I was once again in the Highlands for a short time as I headed up the West side of Loch Linnhe to Corran. 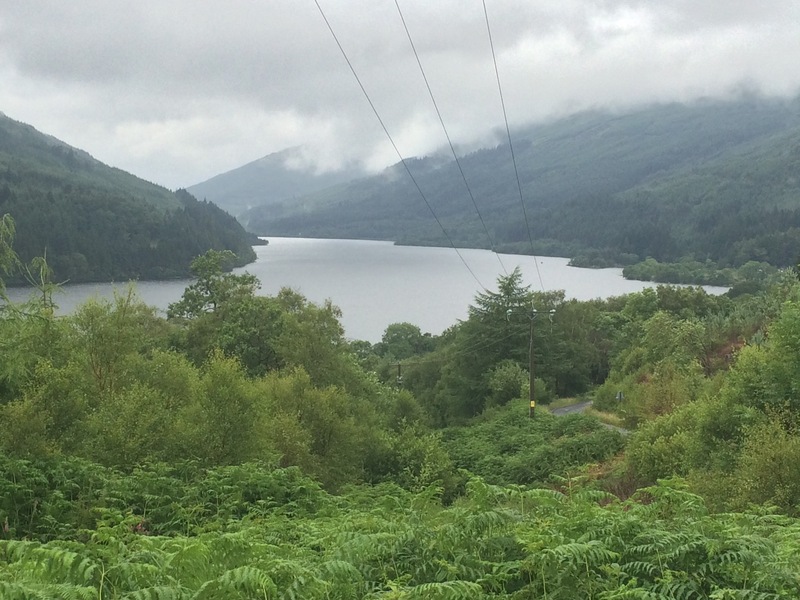 Here I could get a ferry across the Loch, thus avoiding a 40 mile drive around the Loch, via Fort William. What a bonus to arrive and drive straight on board the packed ferry without having to queue. 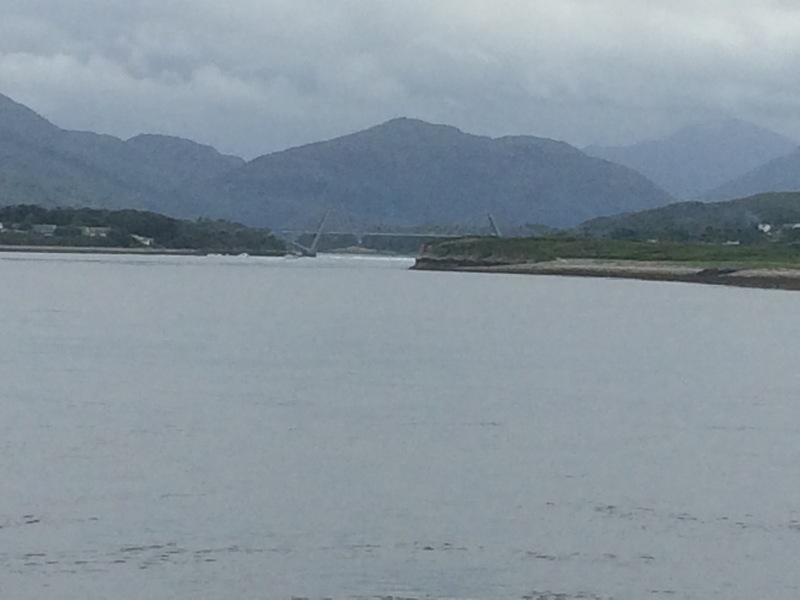 The first of 3 bridges for today was the magnificent Ballachulish Bridge spanning the point where Lochs Linnhe and Leven meet. 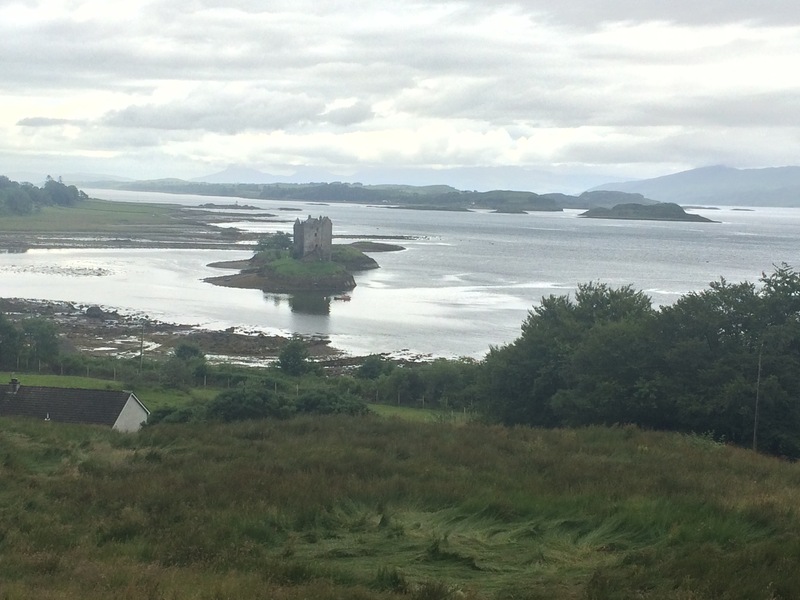 A bit further along the coast there were good views of Castle Stalker, a Clan Campbell residence, marooned on a small island at high tide. The best views were from a well-positioned cafe so naturally I took full advantage and took a break. 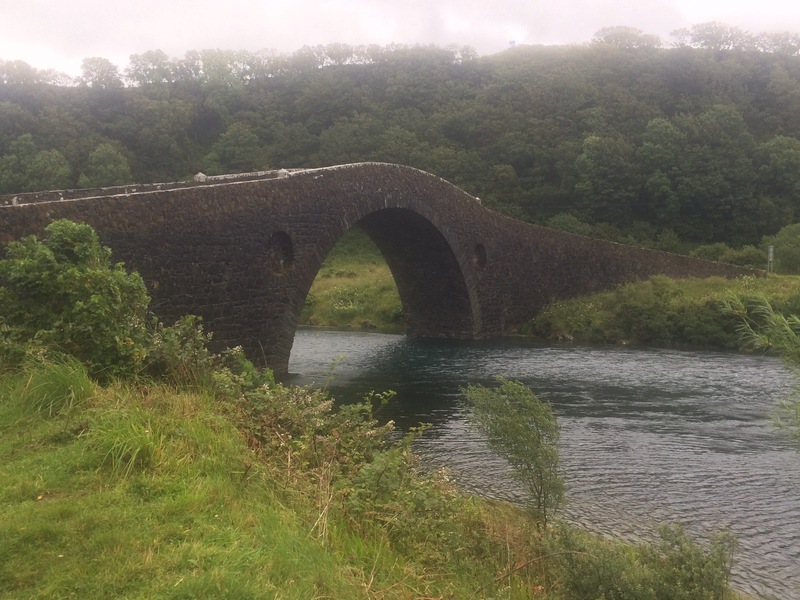 Next up was Creagan Bridge, across Loch Creran and then finally Connel Bridge, which took me out of the Highlands and back into Argyll and Bute. 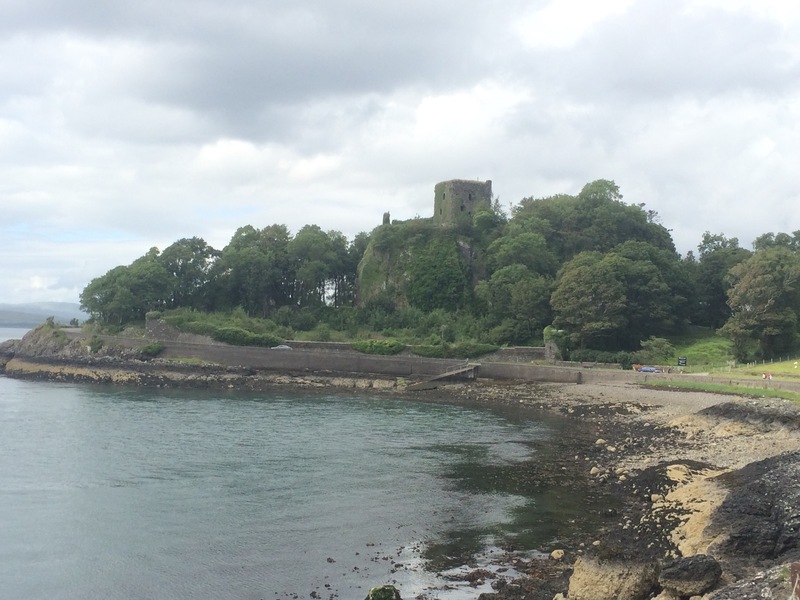 As I approached Oban I stopped at Dunstaffnage Castle for a quick look at one of the oldest stone castles in Scotland. Built on a promontory overlooking the Firth of Lorn it has a great strategic position and is supposedly where the Stone of Destiny was brought from Ireland (later the Stone of Scone). 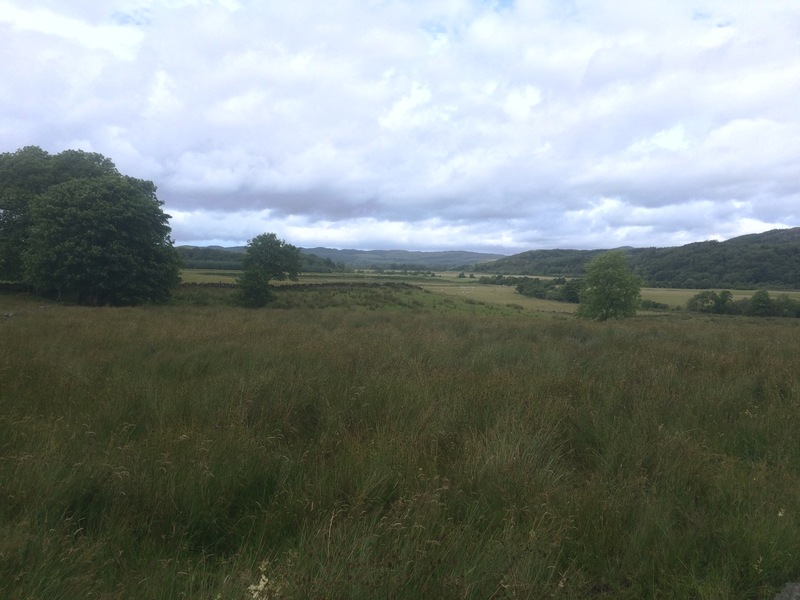 It was once the seat of power for the rulers of Dalriada, the ancient Gaelic Kingdom that included much of Western Scotland and a bit of Northern Ireland. As I approached Oban the sun started to come out for the evening and I could have camped but I’d already booked a hostel to escape the bad weather. 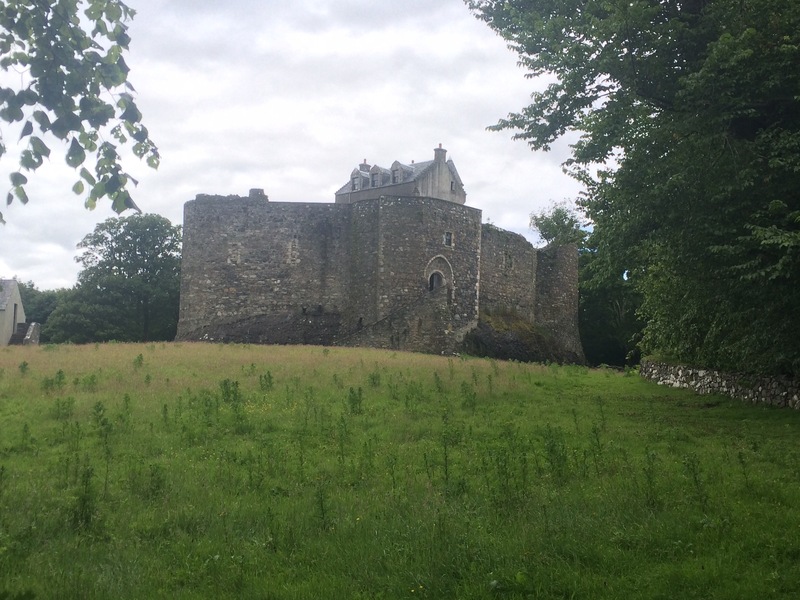 I drove around Oban and along the front towards Dunollie Castle, the capital of the Kingdom of Lorn and the seat of the Clan Macdougall Chief, Lord of the Isles. 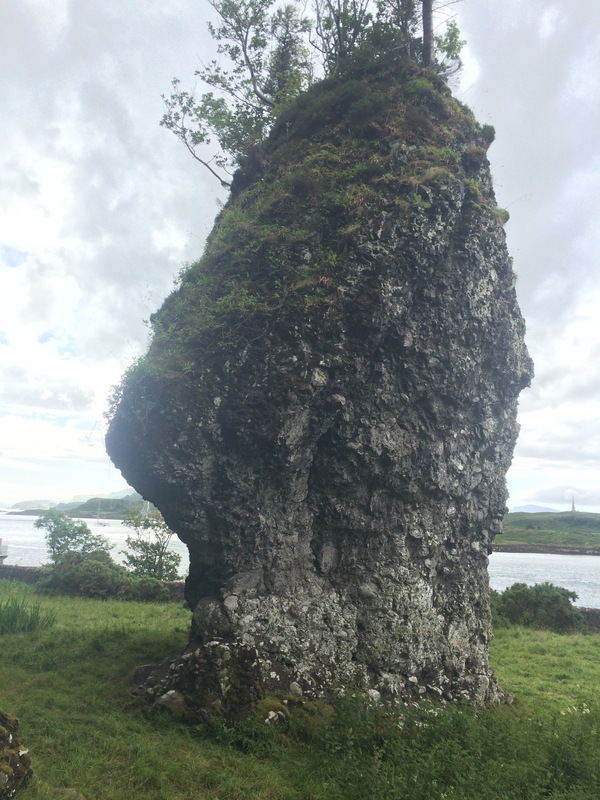 By the castle is a huge rock that is known as the dog stone. 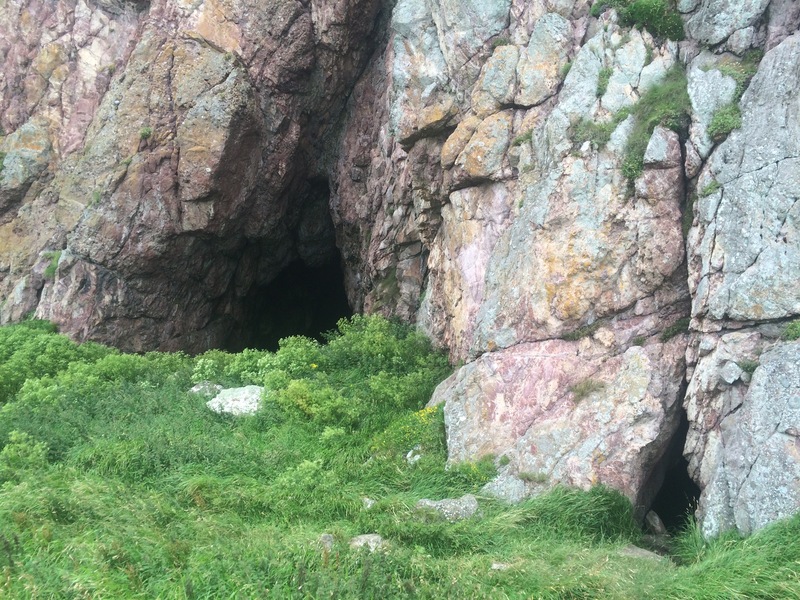 Folklore says this is where the Celtic mythological giant Fingal tethered his dog Bran. 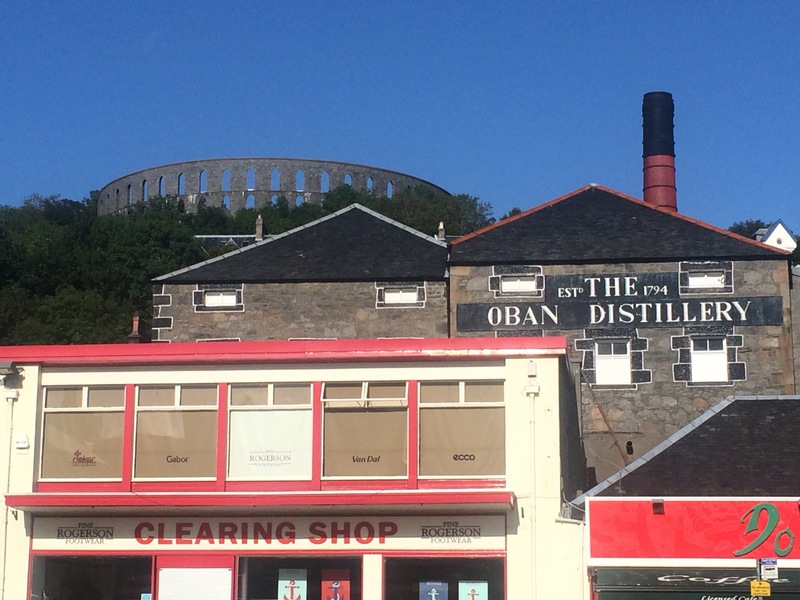 I thought Oban was quite a good looking and busy town based around a port and sheltered by islands. For the best view I walked up the hill at the back of the town to McCaig’s Tower, a circular wall built to resemble the Colosseum. 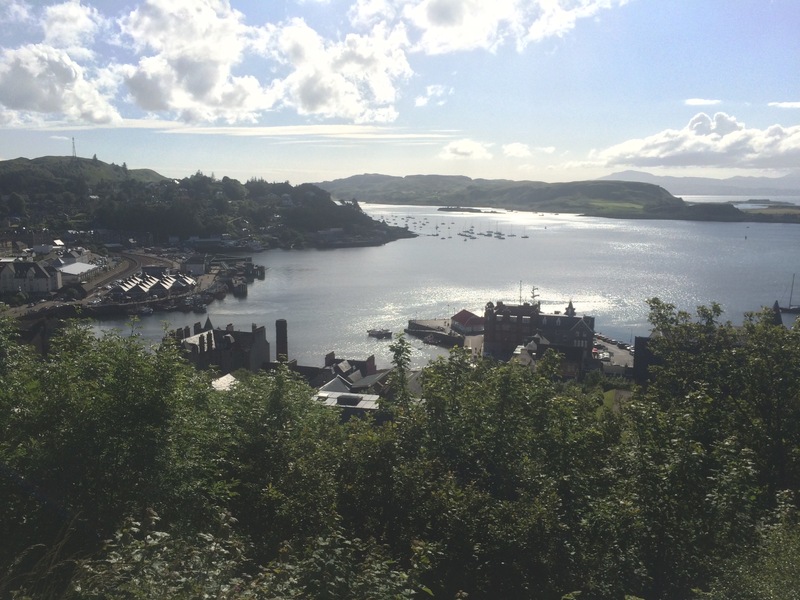 A ridiculous folly but it’s a great view point to watch the sun setting over Oban Bay. The hostel I was staying in was packed and I was sharing a cramped 6-person room with 5 blokes. I definitely should have camped! I decided to go for a nice meal to forget about the cramped, smelly room that awaited and so I splashed out on a good restaurant. The thing about being in my own is that places can often just fit me in without a reservation. I got lucky at Ee-Usk on the North Pier and had a lovely seafood dinner. I was up early after a comfortable night on Maggie’s sofa. Due to a technical hitch with the shower I had my first bath in ages and then it was a dash across Glasgow City centre to Queens Street train station. Maggie even provided me with a packed lunch, I was feeling very well looked after. The train to Fort William was running late and was packed full, although no one sat next to me and I don’t even smell at this point! 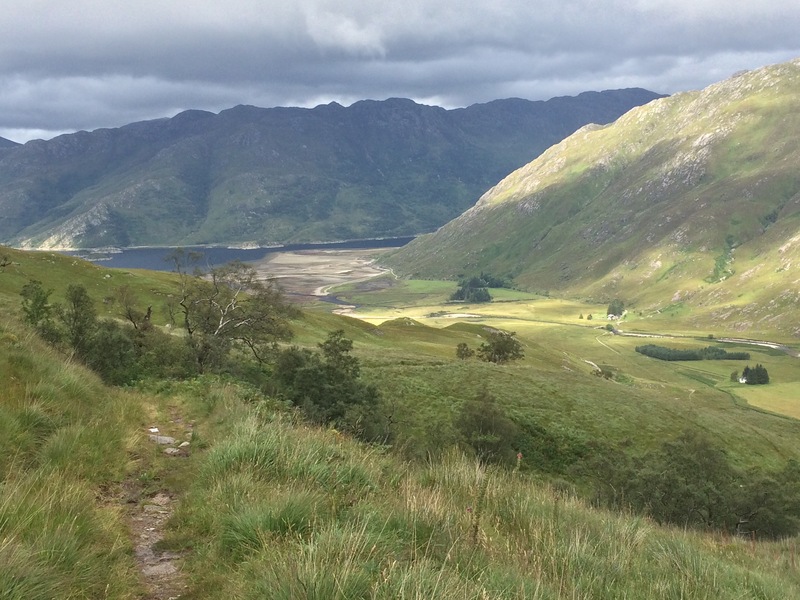 I sat back and enjoyed the scenery as we headed up some amazing valleys and seemed to be following a bit of the West Highland Way. In spite of the usual low cloud I’ve become used to in Scotland that does its best to obscure the views, the journey was picturesque and the train’s trolley dolly was excellent in pointing out landmarks if she came past you at the right time. 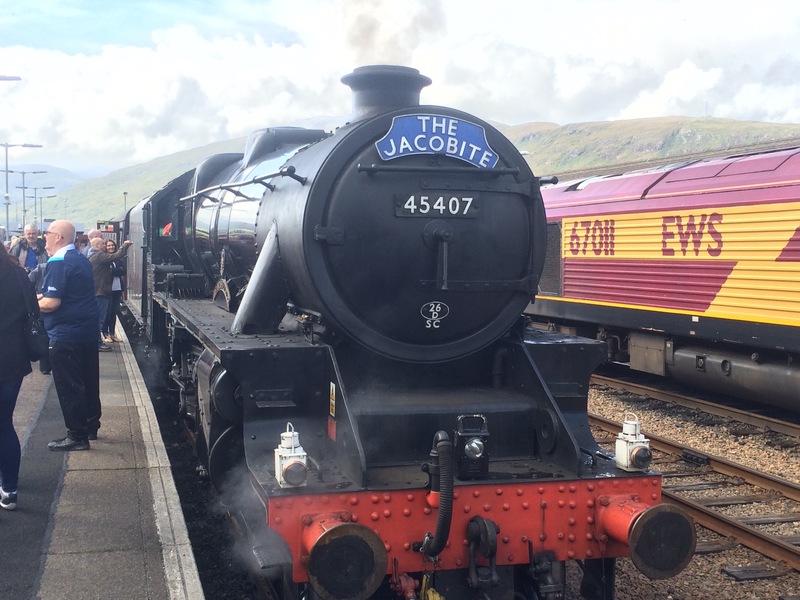 Although the train went all the way to Mallaig I disembarked at Fort William in order to catch the Jacobite steam train that runs twice a day from Fort William to Mallaig. 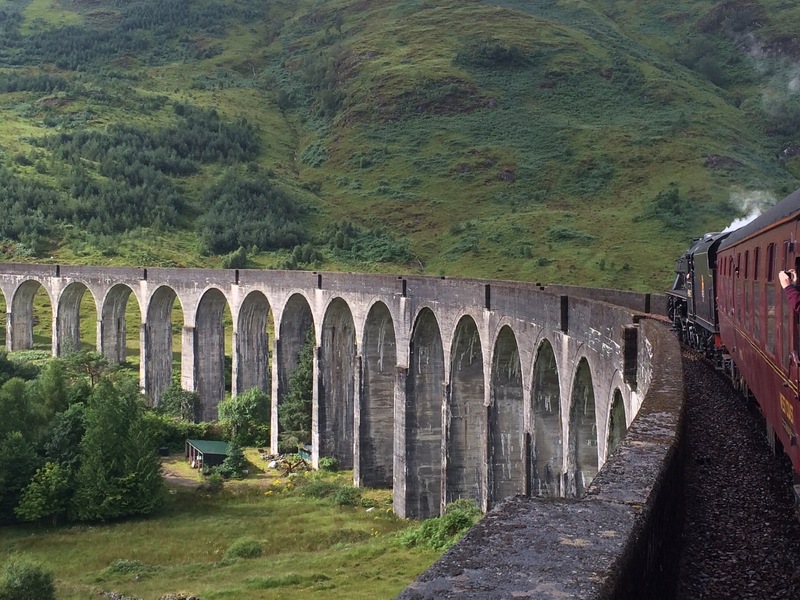 This is the same one that I had watched go over the Glenfinnan Viaduct, the one that Harry Potter catches to Hogwarts. What a treat. The scenery was stunning and the sights and sounds of the steam and the train whistle made it a fun trip. This time I was the one waving from the train at all the spectators as we rode over the viaduct. 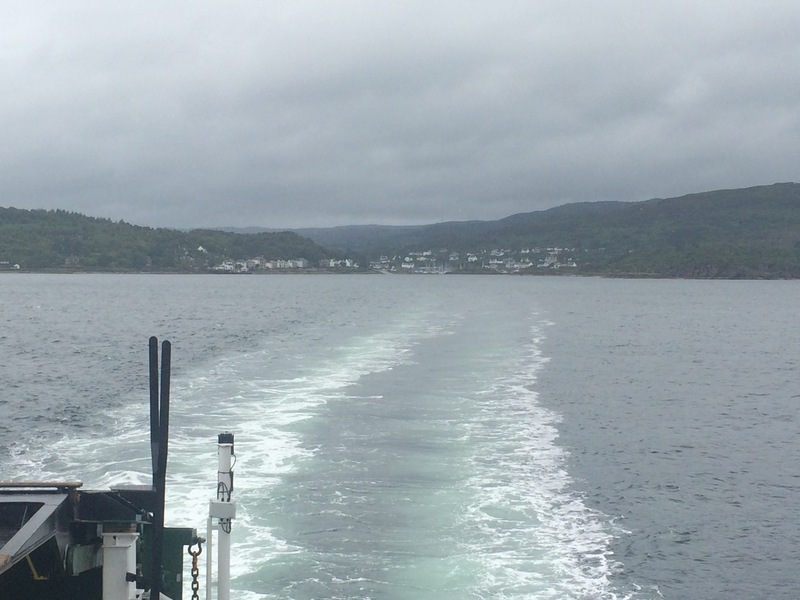 I arrived in Mallaig and went straight to the ferry ticket office as I had a notion I’d catch the last ferry to Knoydart and camp there (there are no campsites in Mallaig). Unfortunately the ferry was fully booked, but fortunately the man in the office very kindly offered me the chance to sleep in the office (a bit like a portacabin) overnight. Bonus. Somewhere dry, warm, with a toilet, a kettle and wifi for the night. I didn’t need persuading. This gesture is a good example of Highland friendliness towards strangers. I was left to make myself at home and given the keys to lock the door. I merely have to open the office up for the boat skipper in the morning! It was nice to be back in a familiar town and I headed to the Clachain Inn for some dinner (my 3rd time in this pub so I must be a regular). My overriding impression of the day was a good feeling to be coming back to the Highlands. I really like it up here; the people, the scenery and the wildlife. It was a 5 hour train trip from London Euston up to Glasgow Central. I should have tried to doze but instead filled my time with watching the World Athletics Championships streamed into my iPhone and bits of the Eurohockey. Oh, and I also looked out of the window! Maggie picked me up from Glasgow station and drove us back to her flat in Renfrew. I met Maggie when camping in Northumberland and she said to contact her when I passed by Glasgow…so I did! It was lovely to meet her again and she very kindly put me up for the night and arranged to take me out in Glasgow. I spent a fabulous evening with Maggie and Allan. We went to the Hilton for fillet steak (delicious!) and then afterwards to a pub called Lebiwskis Pop Up (?) where there is a Thursday night jam session. Allan and Maggie were excellent hosts and great company, and I was very appreciative of Allan treating me to such a wonderful dinner. The live music topped off a lovely evening and I thought the musicians were very good, particularly Kenny on the keyboard (he bought me a drink) and Big Paul on the guitar. This was a jam session for rock musicians of a certain vintage, a pretty good vintage by the sound of it! Needing to relinquish the hire car, getting close to leaving Scotland and just wanting to go home all combined into a plan to drive back down South, drop the car at Heathrow Airport and have some time at home. I had a lovely couple of weeks off from my trip, didn’t give it any real thought and lapsed on my blog. I did however manage to do the following: see my mum, do the gardening, visit friends and family, go to my local pub, see Benedict Cumberbatch in Hamlet (thanks Donna), take a guided tour around Westminster Palace (highly recommended), visit Birmingham library (also recommended), watch 2 Eurohockey matches and go to a wedding. I also ate and drank too much. I need to get walking again! To aid my walking I managed to exchange my boots for a new pair, thanks to Cotswold Outdoors for that. The pair of Salomons I bought in Norwich had developed a split near the little toe (down to over use!) and because I’d only had them just over 3 months I was able to exchange them for free. Fortunately the shop assistant didn’t ask how much they’d been used as I’ve walked over 800 miles in them and worn them every day through sand, salt water and bogs. Bonus. Another week of inclement weather but lots to see and yet another change in the landscape as I ventured into the SW Highlands and then into Argyll and Bute, the county to which the Isle of Mull belongs. Having a car has been enabled me to make the most of my trip in the bad weather, certainly providing shelter and thus indirectly promoting a positive outlook. I have seen more, and also less, than I would otherwise have done. 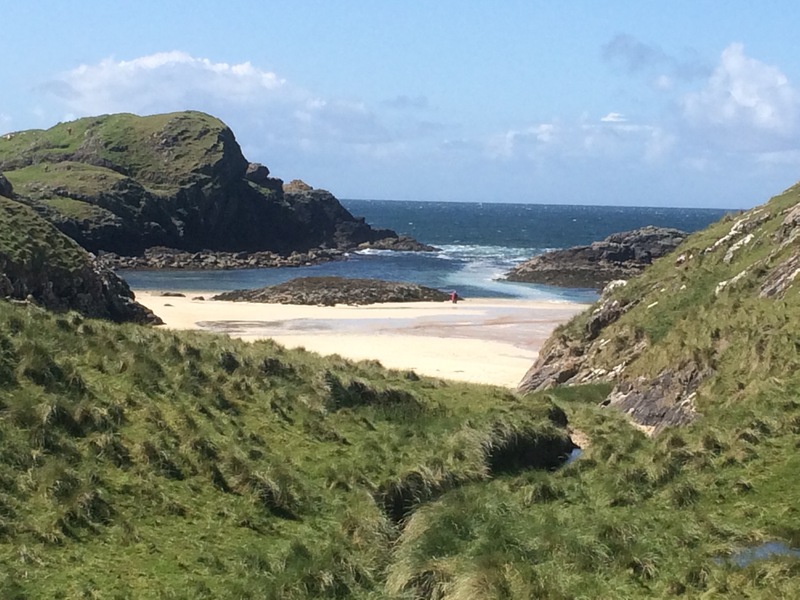 The extra things I have seen come from covering greater mileage, stopping at more museums and the like, and of course from travelling inland as well as around the coastline. Where I feel that I miss out is by not being immersed in my surroundings, which means less wildlife and a faster, less intimate experience. I have enjoyed the contrast more than I thought I would, although I do look forward to getting back to the exercise of walking (I haven’t stopped eating cakes and it’s taking its toll). This week the theme has definitely been the white sandy beaches. When I first got to Arisaig I was astounded by the pure white sand and the little islands of rock (and sometimes grass) that punctuate the bays and are marooned at high tide. The sea this week has taken on different colours, particularly around Iona, which I think comes from the relatively shallow bottom that is a mix of sand, seaweed and rock. Truly stunning when the sun comes out. I enjoyed my first experience of a Highland Games and I definitely have to go back to Mull as it’s a beautiful island and has so much wildlife. 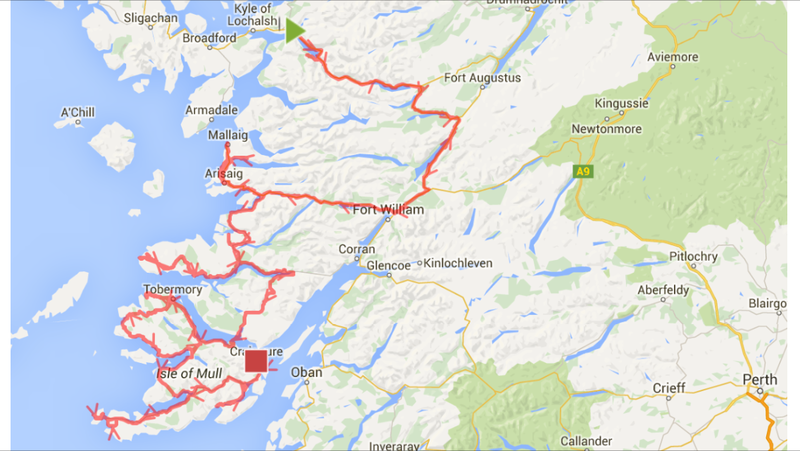 I agree with the description I’ve heard of Mull being “The jewel with the gem at its feet”. The third highlight of the week was standing at the top of the lighthouse at the Point of Ardnamurchan in the glorious sunshine admiring the views. 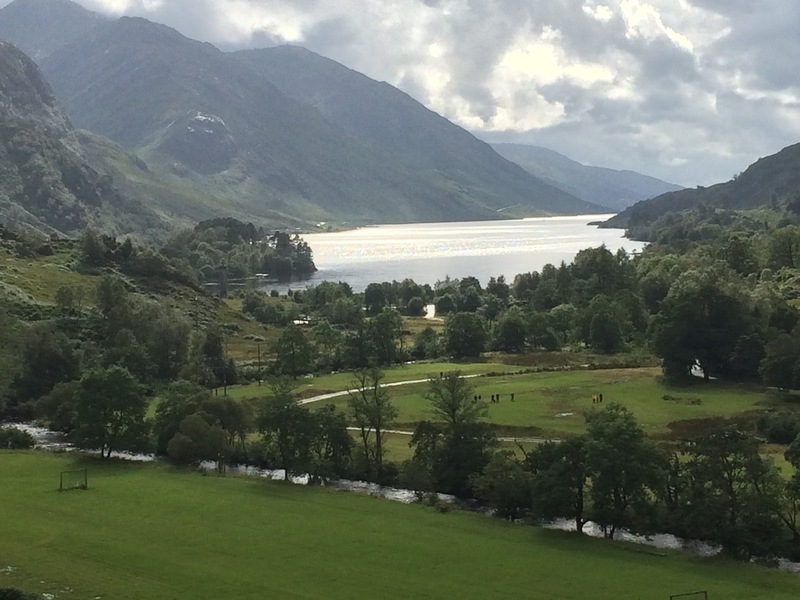 I feel a little sad to be leaving the Highlands behind next week. Despite the (mostly) terrible weather I have really enjoyed this wonderful part of the country and can see why it’s very popular with foreign tourists.